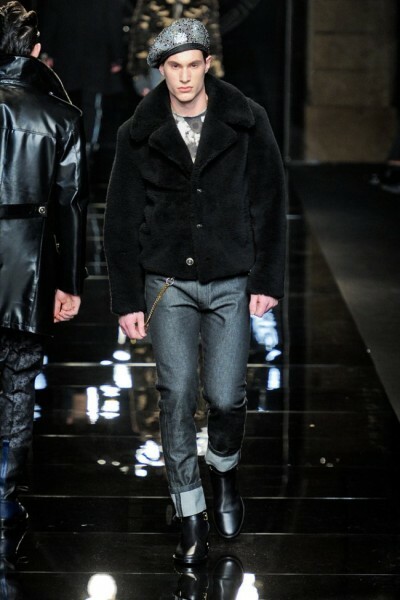 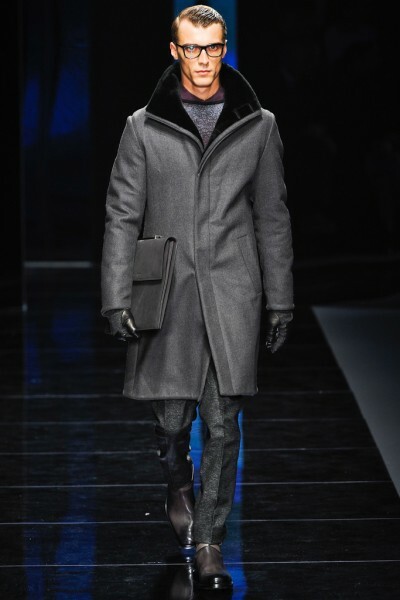 Fendi‘s winter took inspiration from the Nordic aesthetic for their upcoming fall/winter collection. 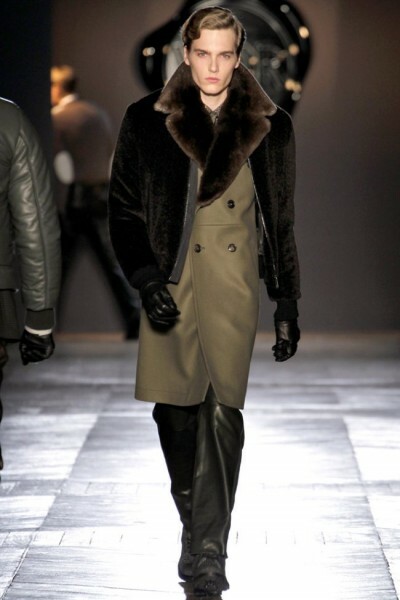 Its aesthetic is reflected from the heavy furs and wool due to the region’s in-climate weather. 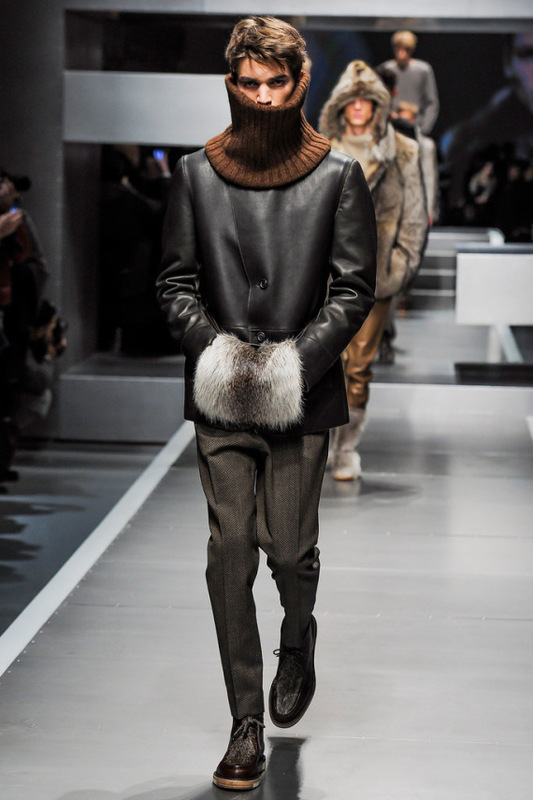 Chunky knits, parkas and Icelandic fisherman’s coats were showcased in earth tones. 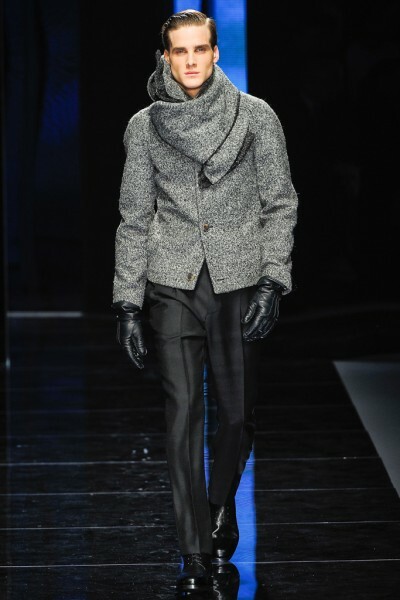 The garments were also accentuated with great textures. 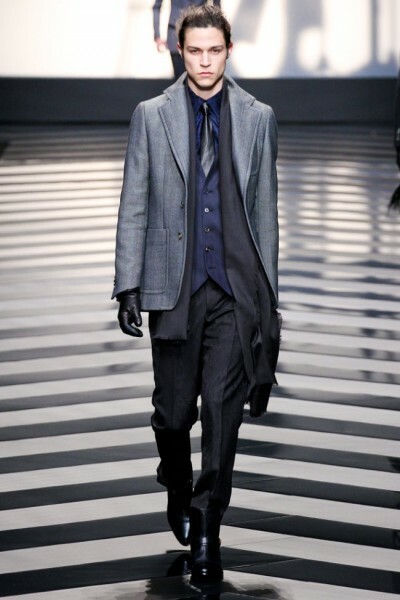 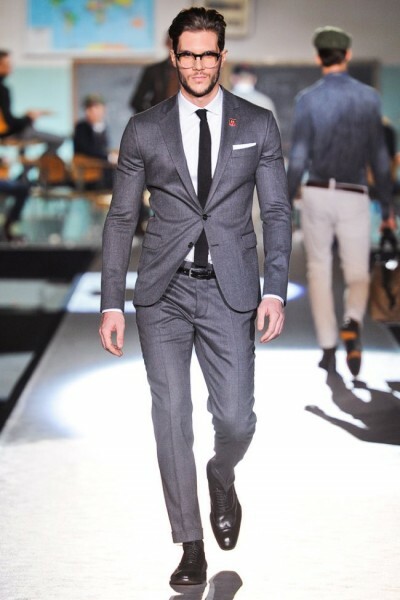 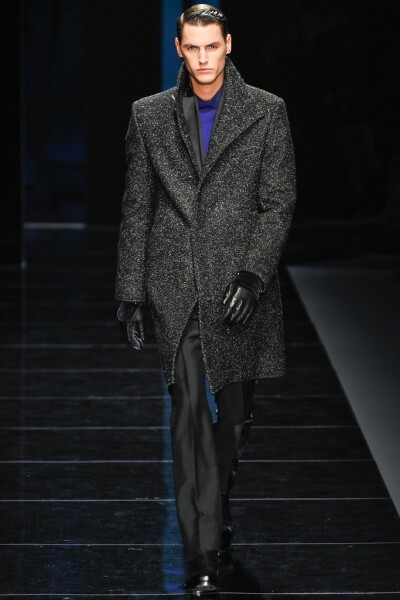 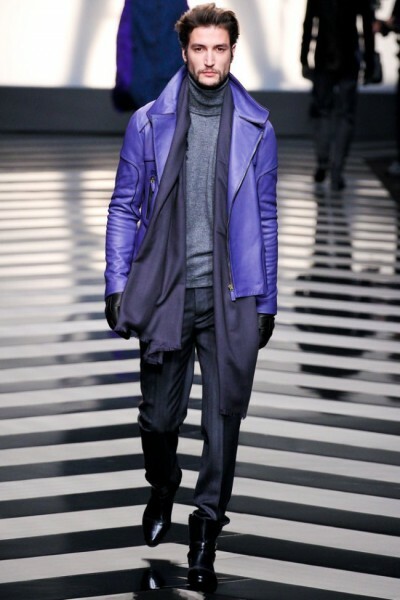 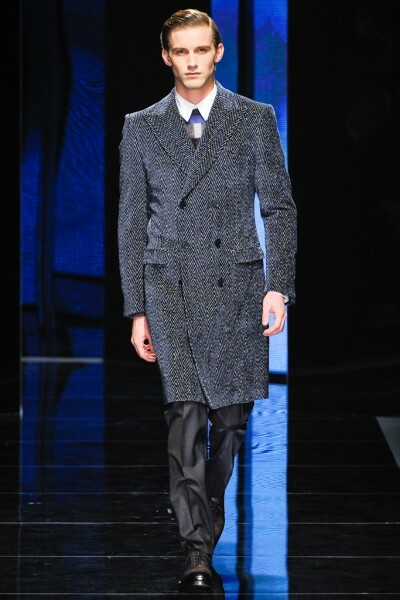 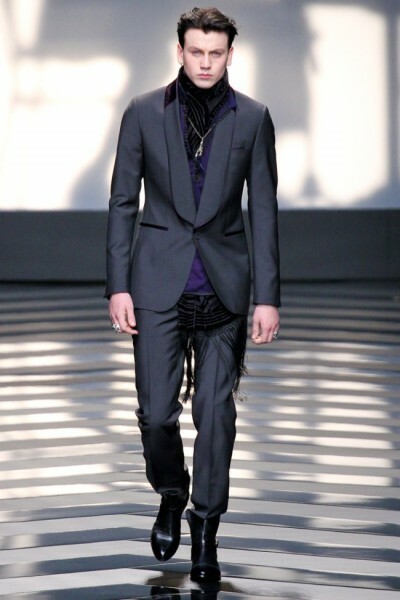 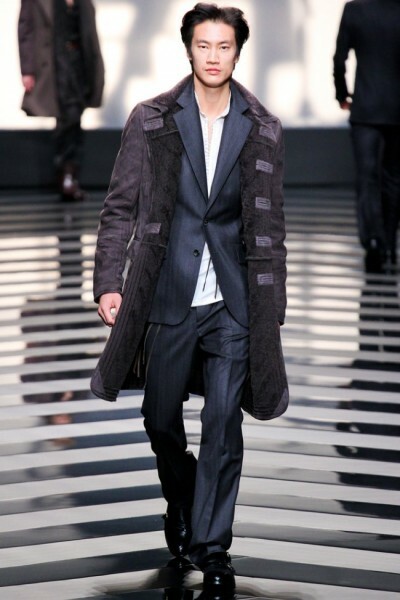 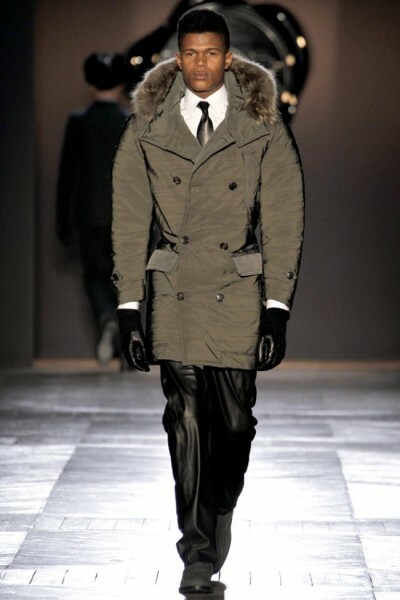 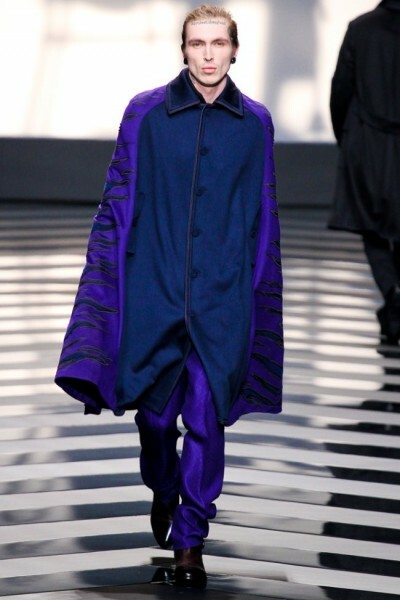 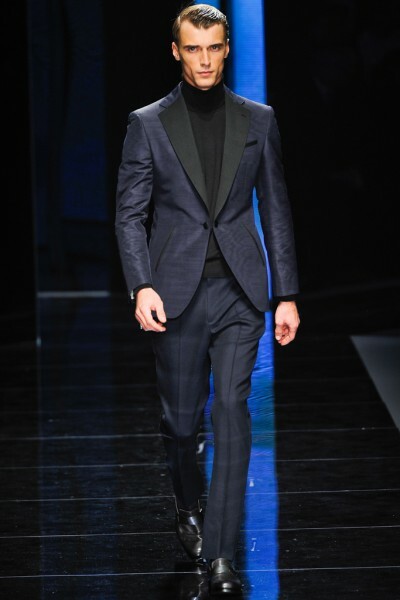 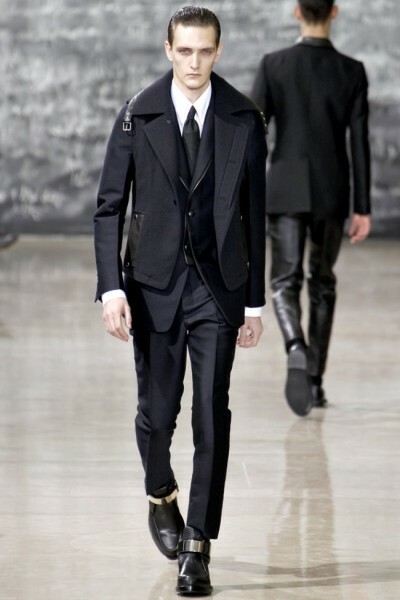 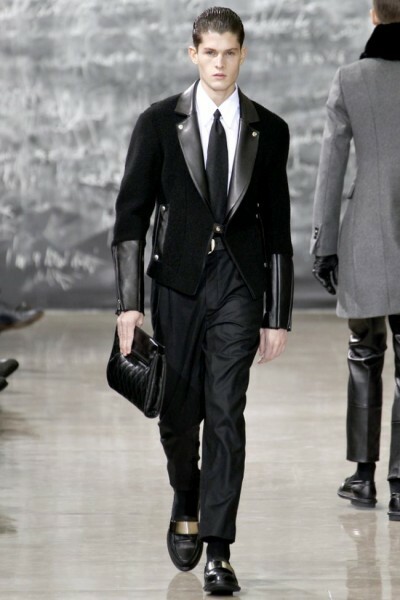 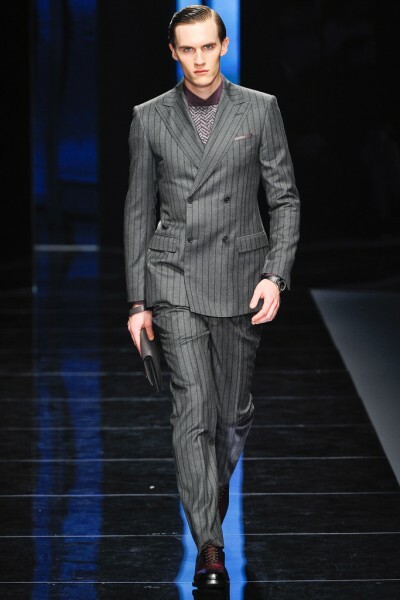 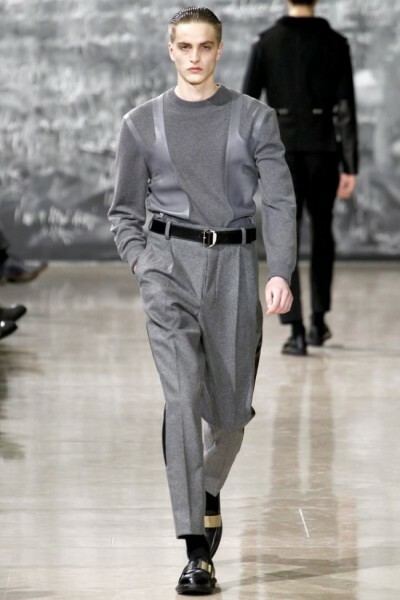 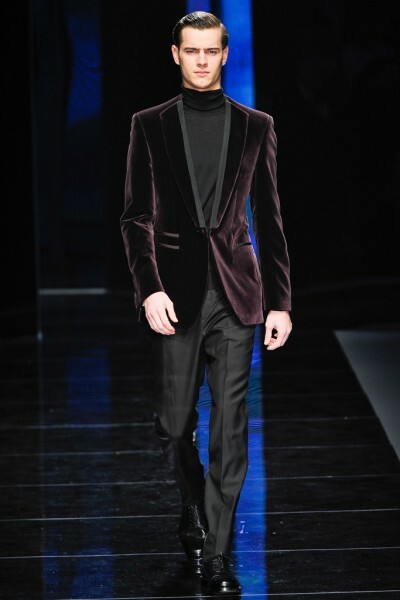 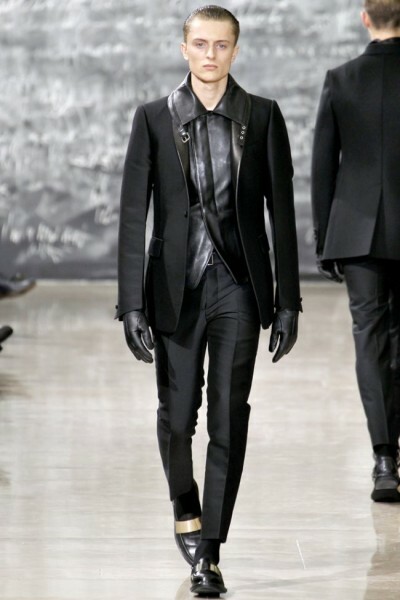 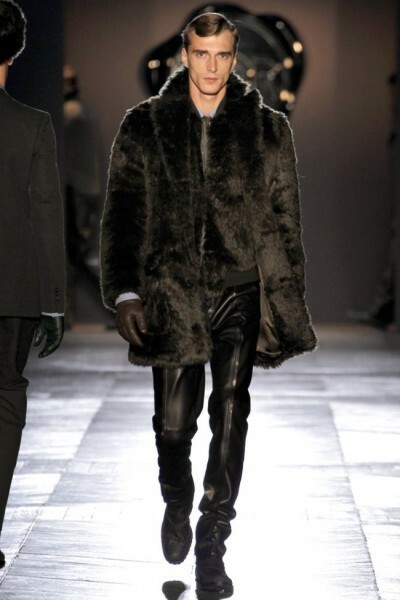 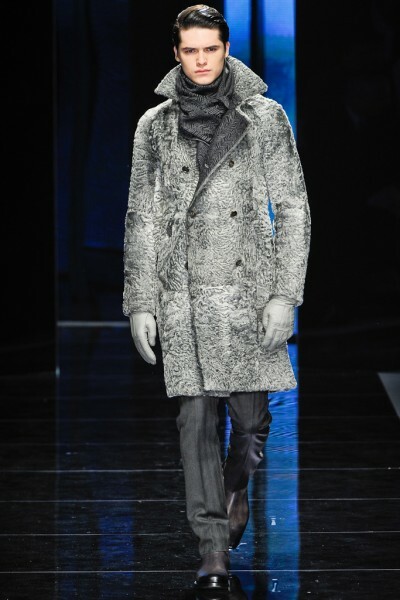 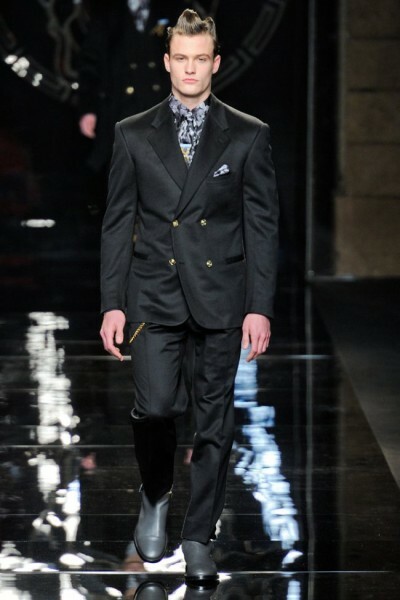 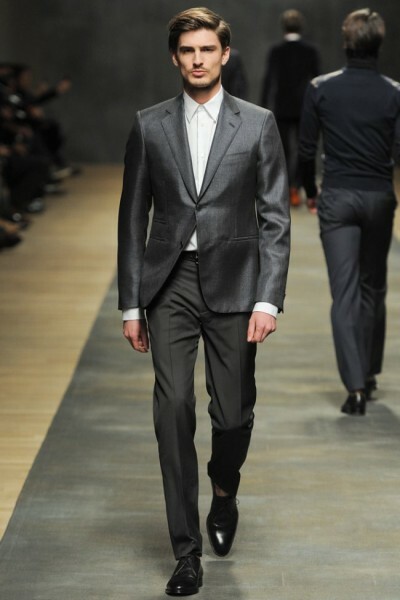 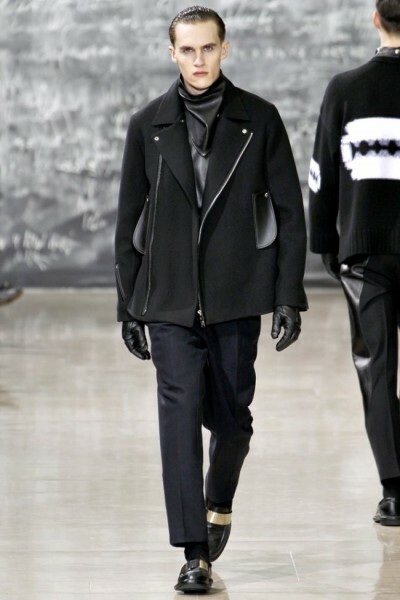 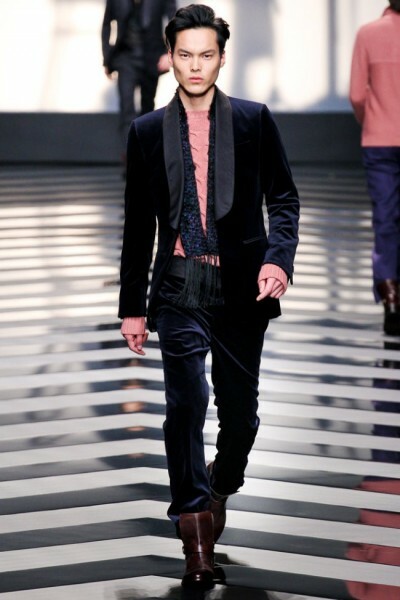 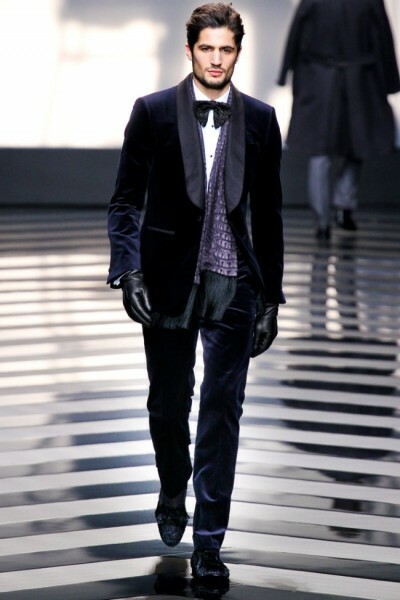 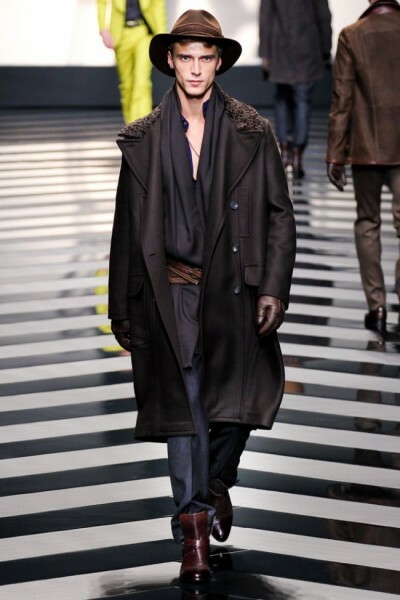 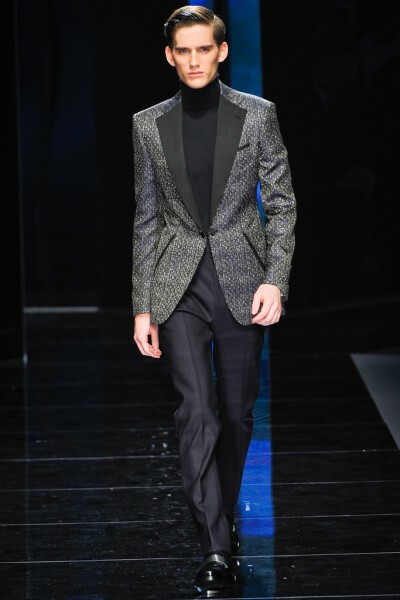 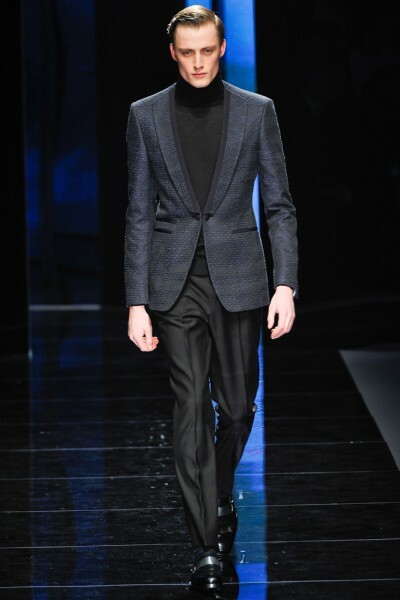 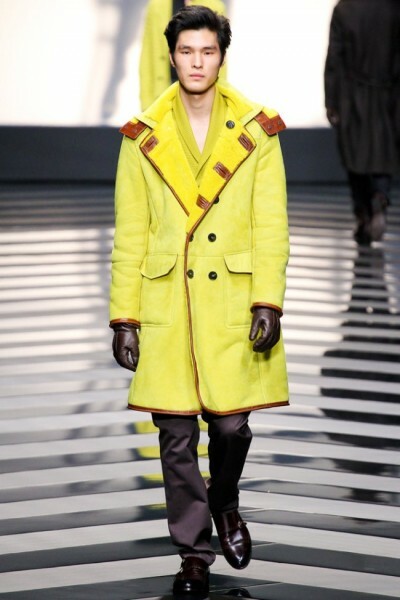 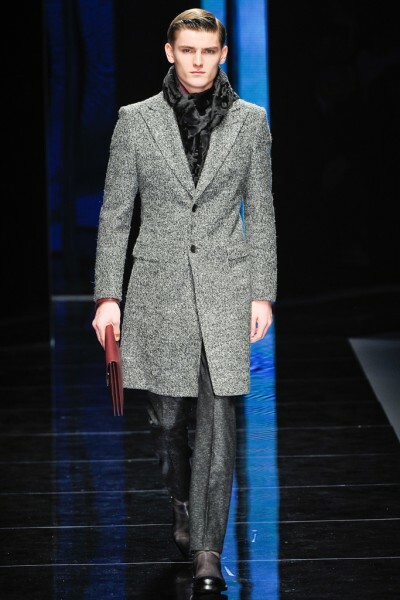 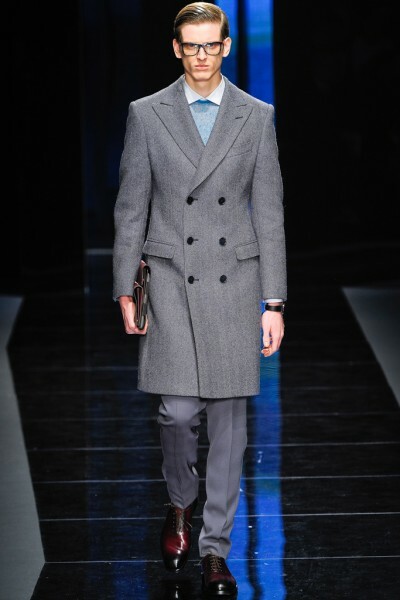 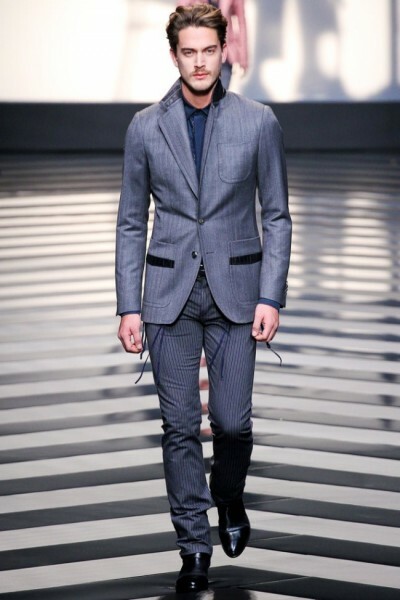 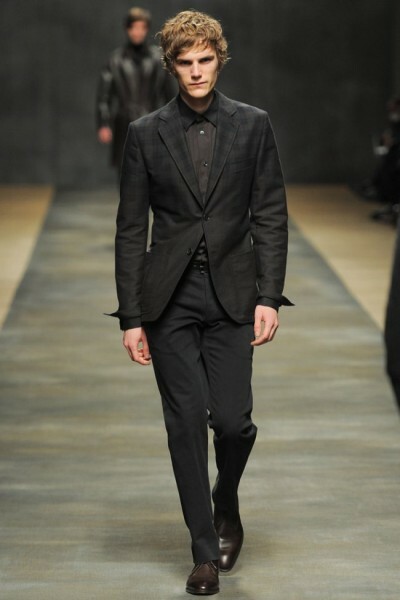 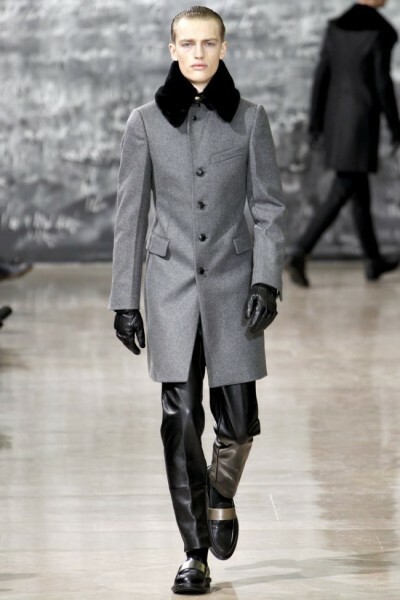 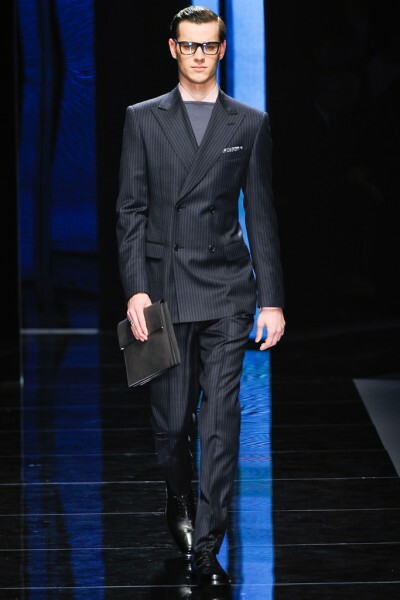 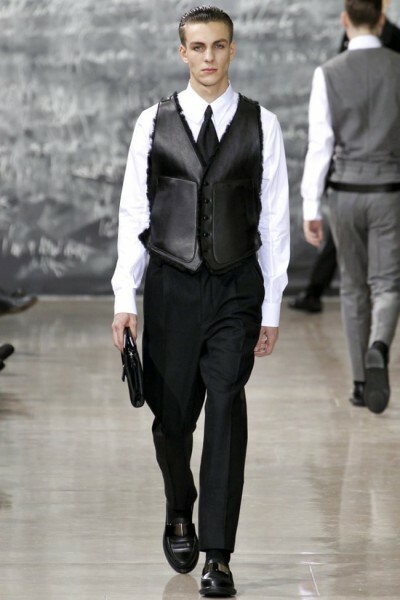 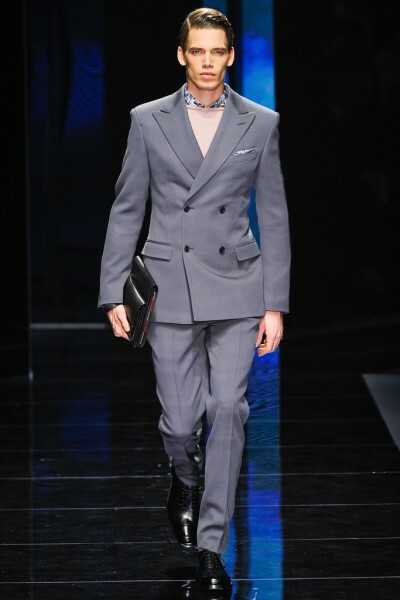 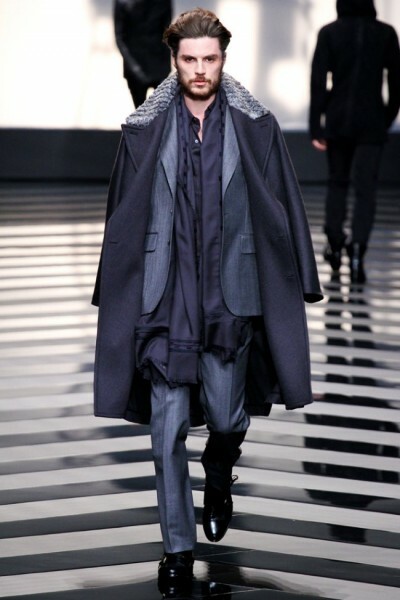 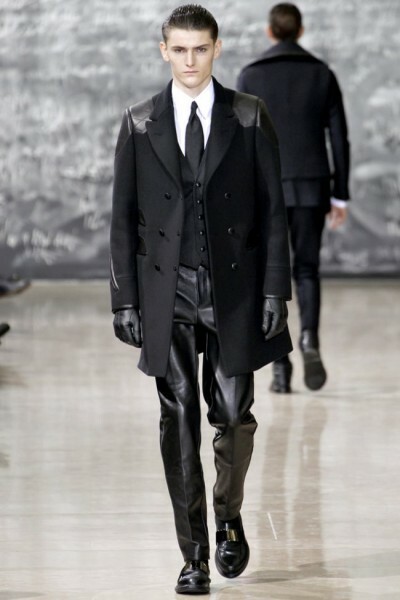 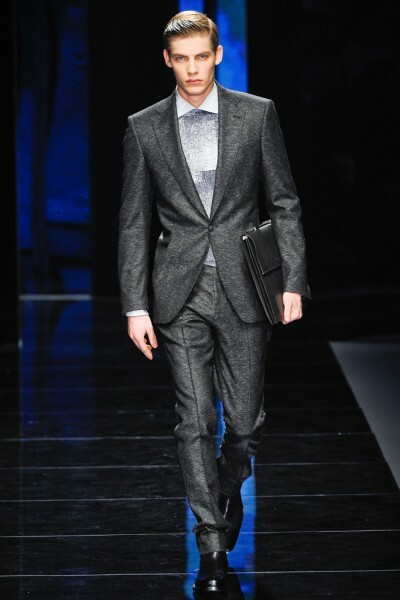 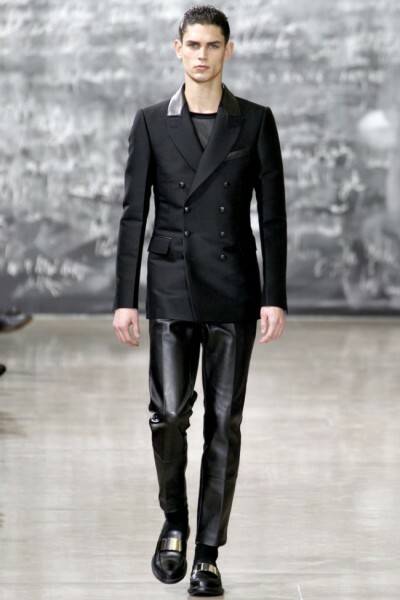 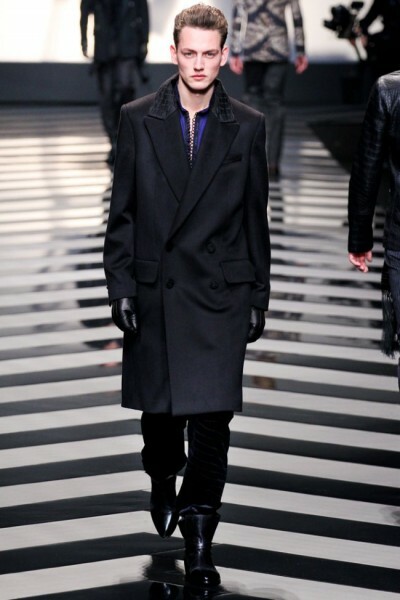 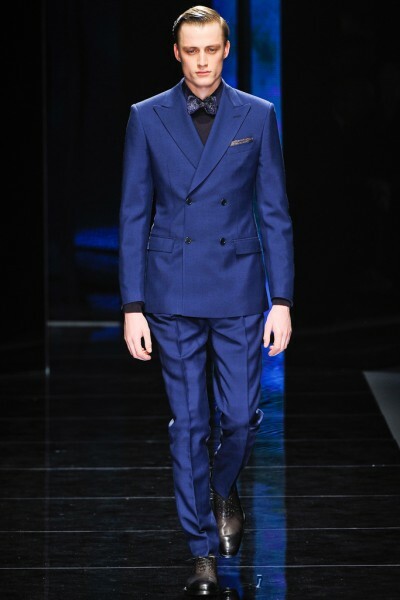 To soften up the approach of the collection were the wool suit layered with slim topcoats and satin-lapeled tuxedos. 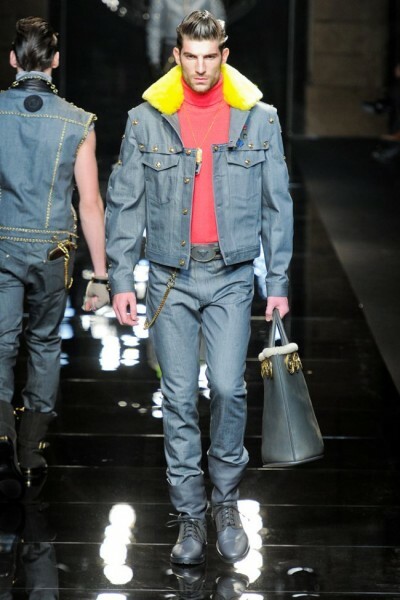 For those who never thought fashion can not exist in Kentucky (let alone Louisville), they were mistaken. 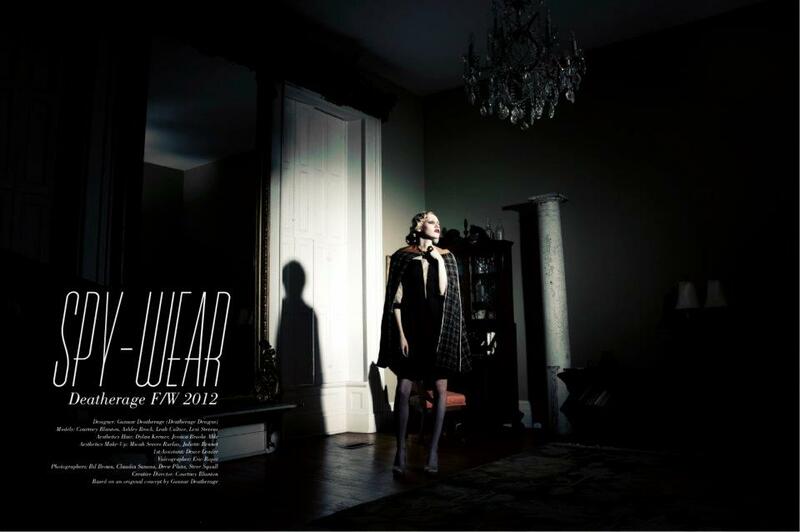 Gunnar Deatherage (Project Runway) has recently showcased his look book for his 2012 f/w womens wear collection. 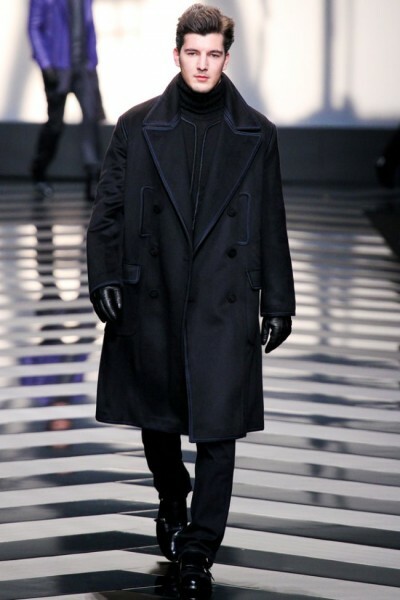 Infiltrating down the nostalgia rabbit hole, Deatherage gained inspiration from female spies from world war 1 and 2 called the MI5 and MI6 paid to be beautiful, yet trained to be deadly. 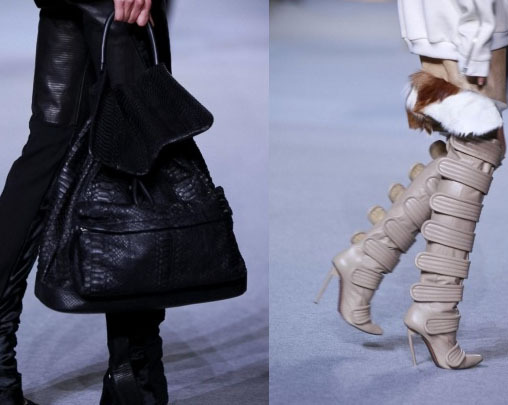 It is interesting he used their particular women as inspiration. 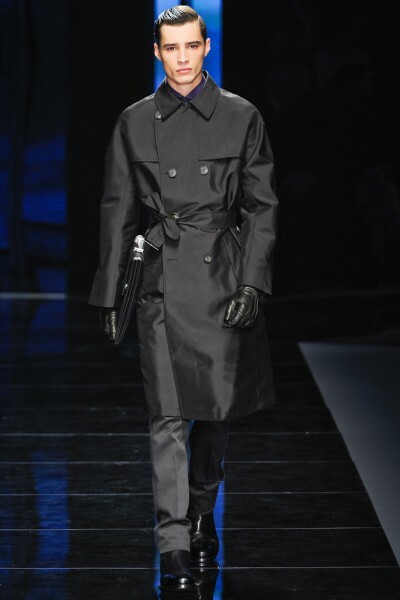 The great thing about is many people in this generation are not aware of how much these women have risk their lives as much as the men on the battlefield! 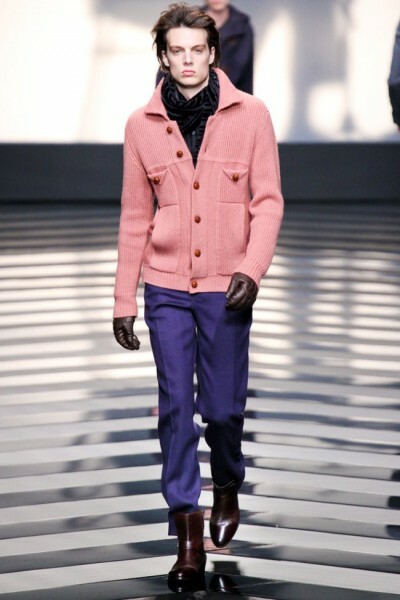 With the 50s and 60s trend in womens wear taken effect, this collection was right on time. 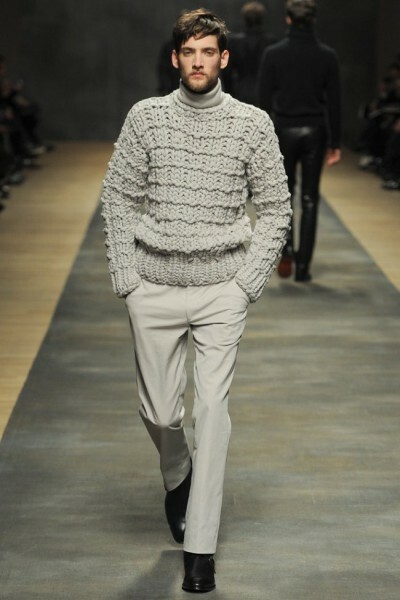 He kept the collection with neutral colors. 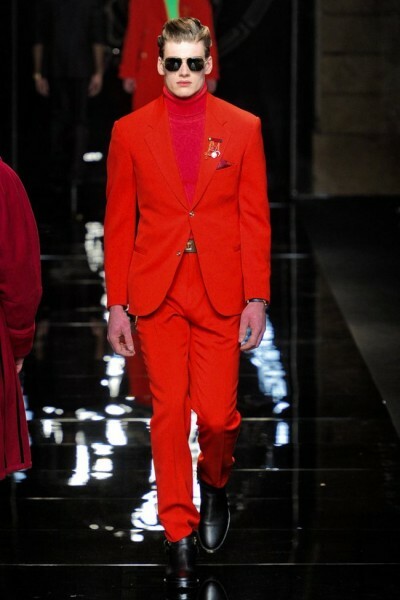 In my opinion, the hues gave a mysterious tone which explains its subtlety. 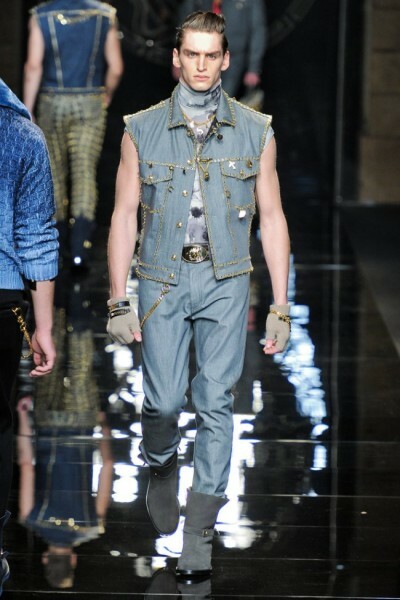 All clothing will be for purchase at the end of may 2012! 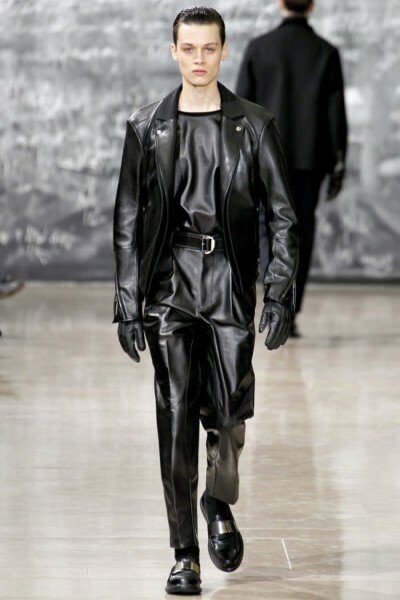 Despite what has been said from fashion critics, Hip Hop/Fashion Icon Kanye West has been determined for to eat their turds! 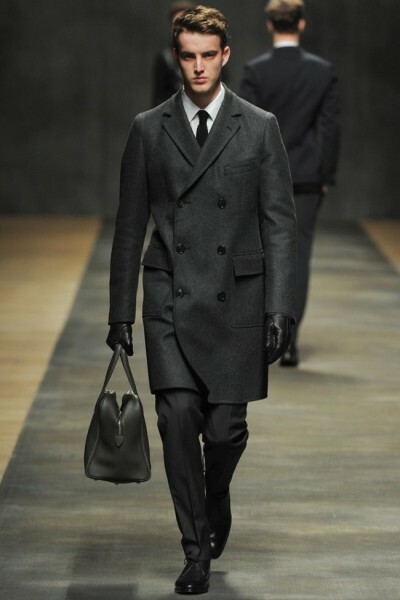 There is nothing greater than showing improvement from your previous work. 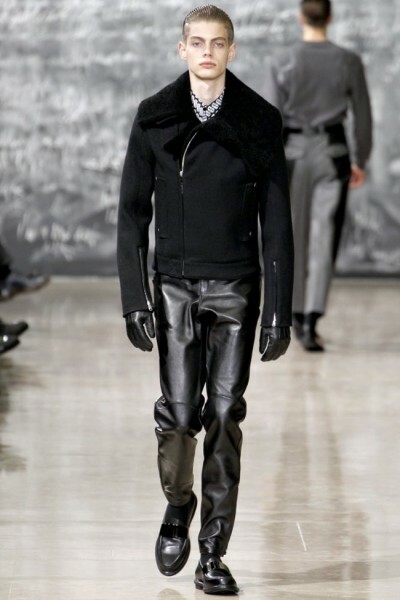 Kanye’s fall/winter collection has proved to be a perfect example. 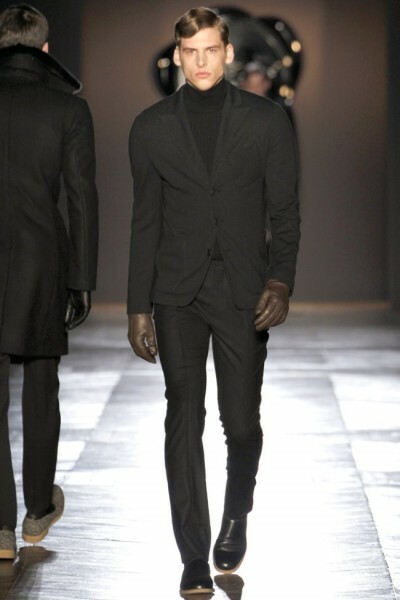 With ensembles majority in all black, the focus on detail will leave an undeniable towards any one whose seen the collection. . 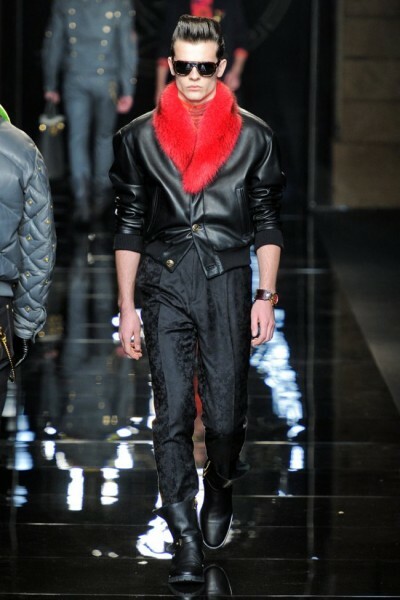 There were beautiful textures of butter smooth leather jackets, tops and trousers along with extravagant furs and dope heels. 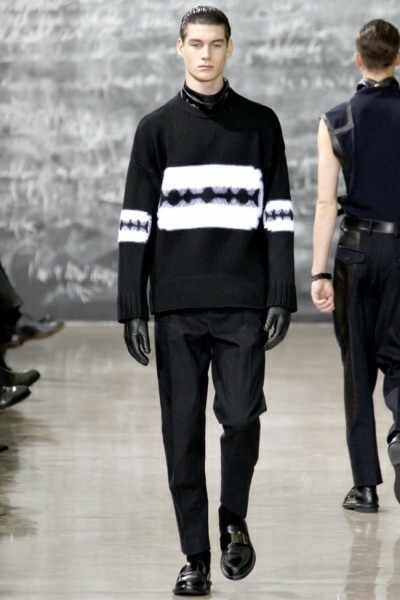 Judging from the collection’s noir emphasis, it would not surprise me if there was some inspiration from Givenchy‘s Riccardo Tisci. 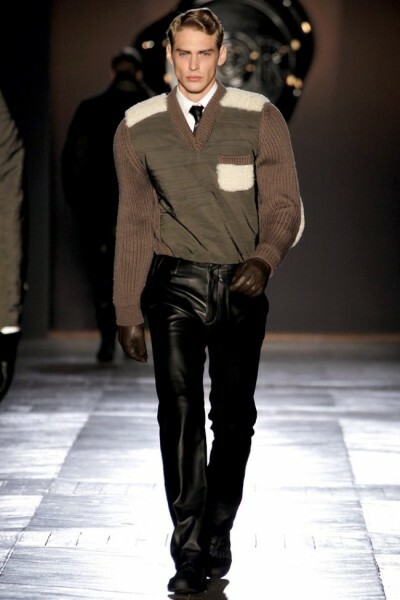 Kanye has really been promoting the Tisci’s aesthetic for quite some time now. 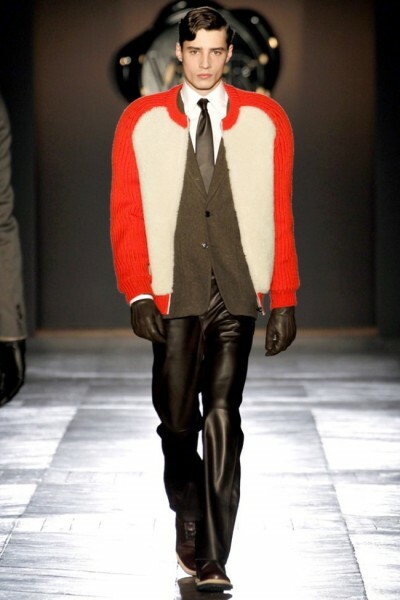 There has been rumors he helped out with the collection. 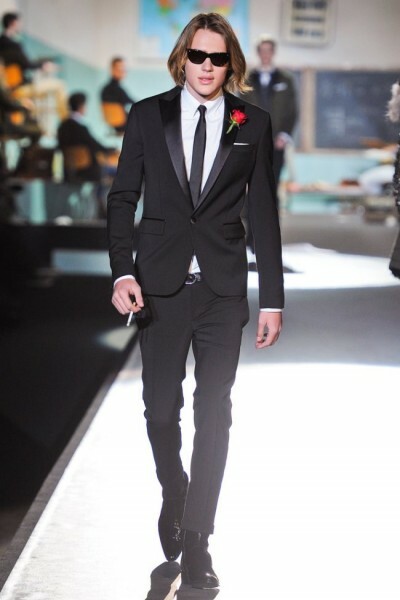 There is no hating whether if he did or not. 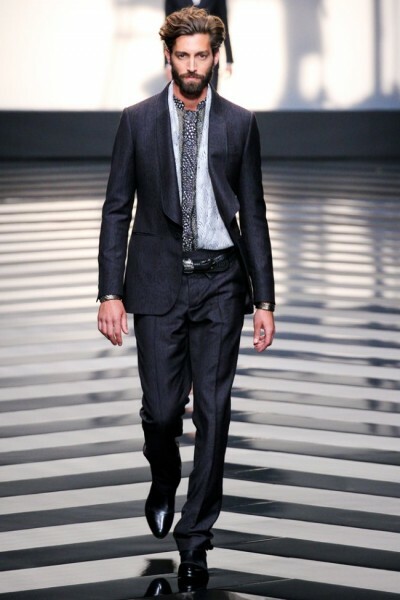 If you are going to get help, you will ask one of the best! 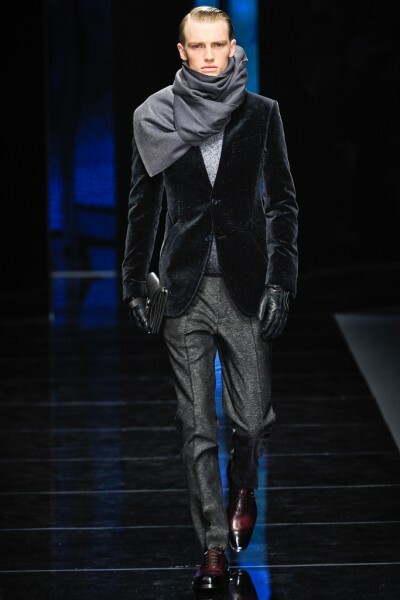 I am very confident people are going to give a much more warming review towards this collection. 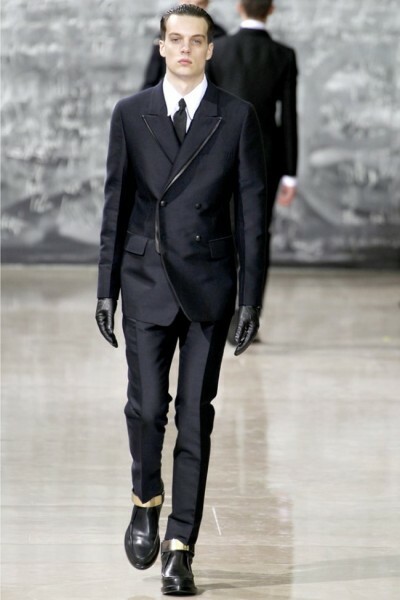 Its growth is purely inevitable! 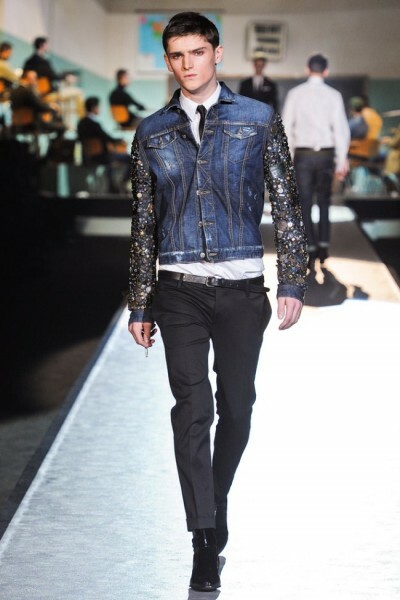 Remind you the first collection was not necessarily bad; rather, it was nothing innovative as if they were picked from various designer’s collections. 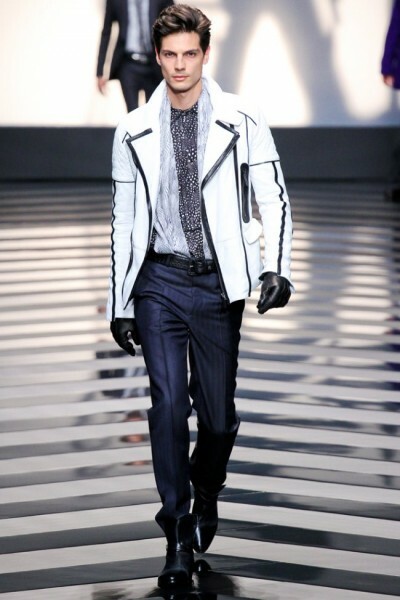 I am happy to see the evolve of my idol’s work. 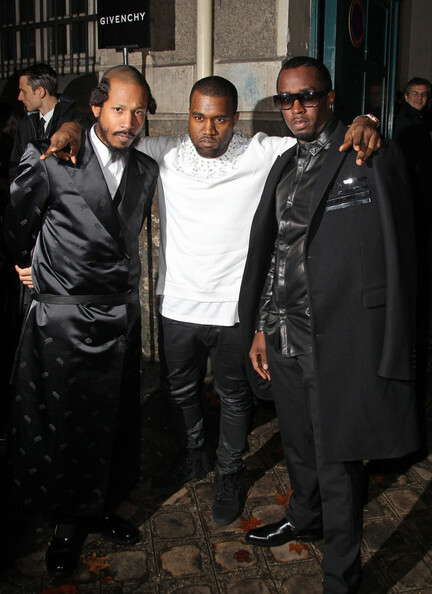 There is nothing any one can change the Kanye’s perception on anything he’s passionate about. 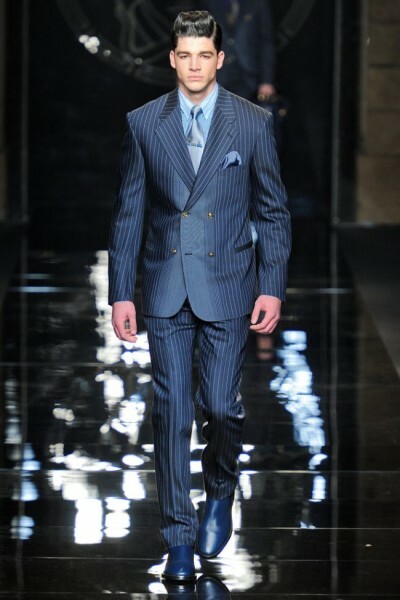 That’s what make the collection special! 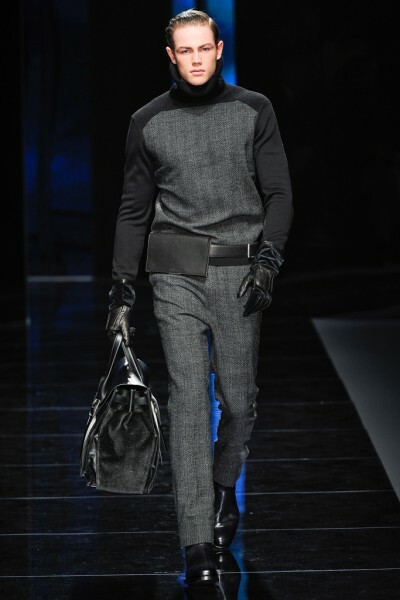 A slam from critics delivering a knockout collection as such can sweep one-off their feet! 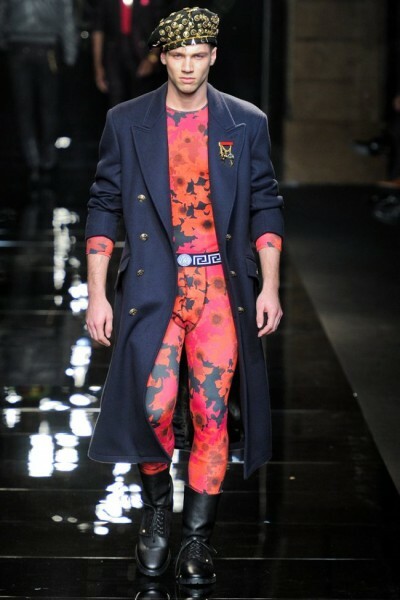 It’s like a fighter determined to deliver a specific strike. 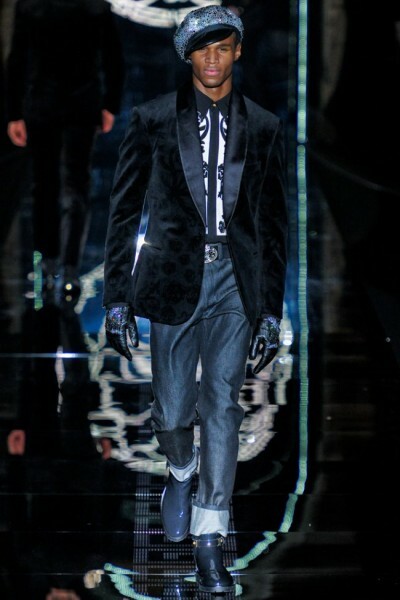 Even if you choose to knock him out, he’s going to at least accomplish his goal and that is what exactly he has done here! 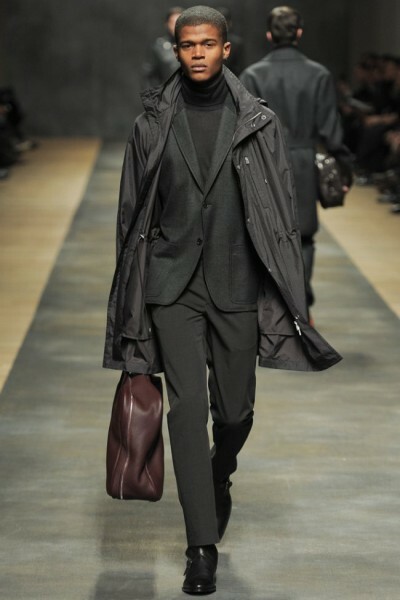 Hermès creative director Veronique Nichanian kept to a dark color palette. 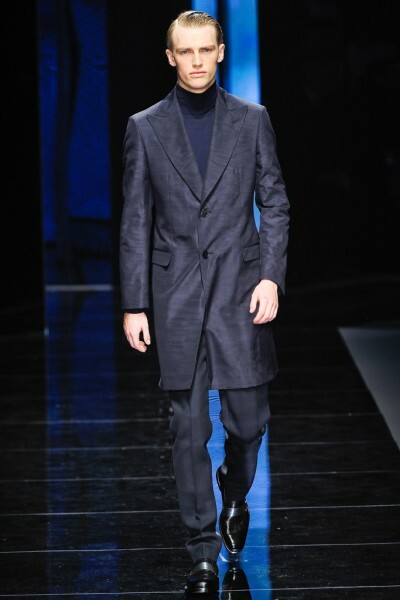 With impeccable construction, in a sea of somber suiting and outerwear, pieces like a soft trench from leather created a wow factor when not embraced by sleek trousers as well as carryalls. 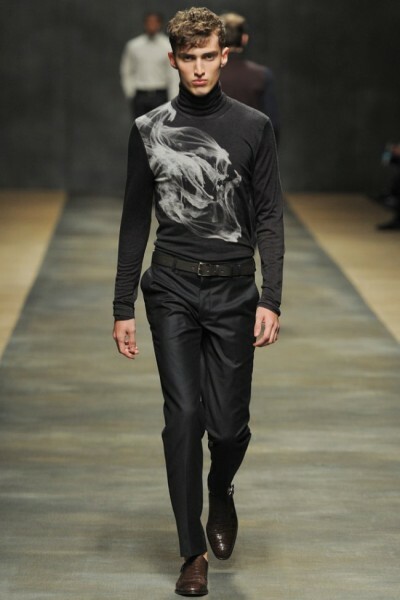 This is probably one of my favorite collections so far when it comes to design. 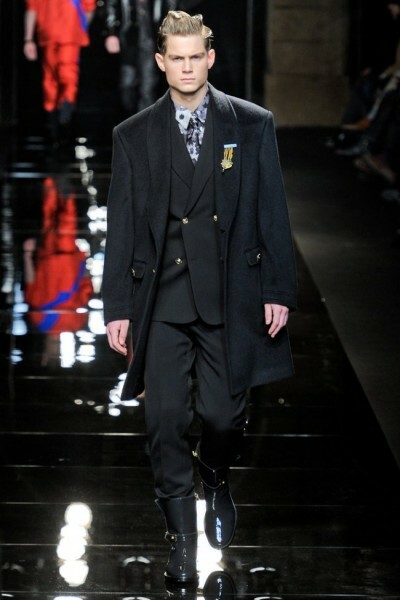 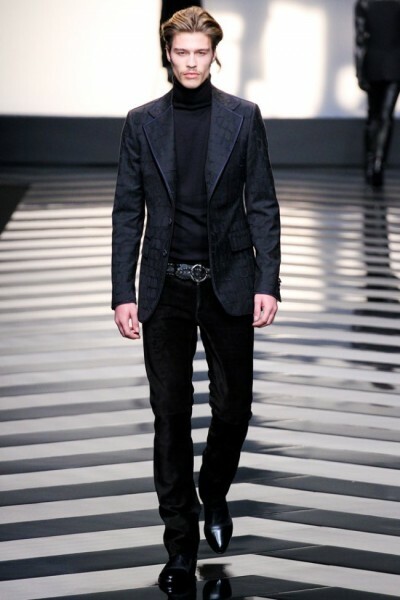 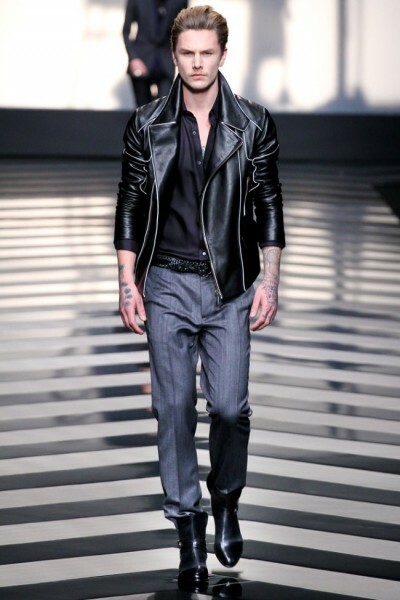 The images featured are from the Yves St Laurent A/W 2012 collection. 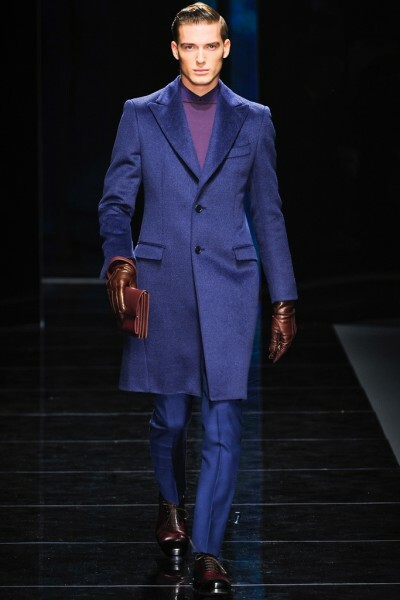 It appeared Stefano Pilati took the absolute route regards to the color palette. 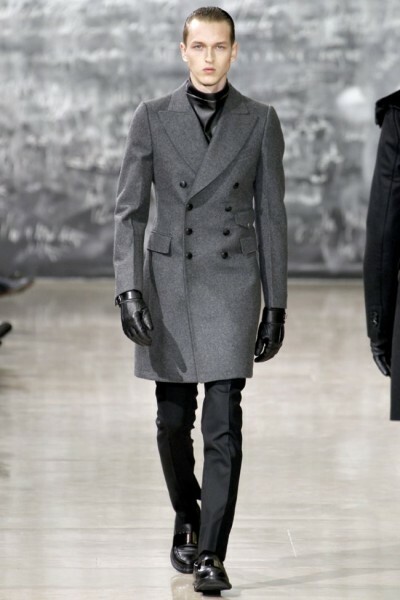 Simply because majority of the color palette is black and charcoal doesn’t mean it lacked in design. 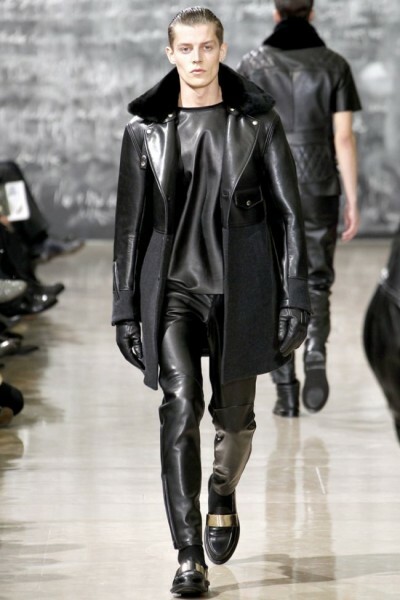 There was some gorgeous leather garments. 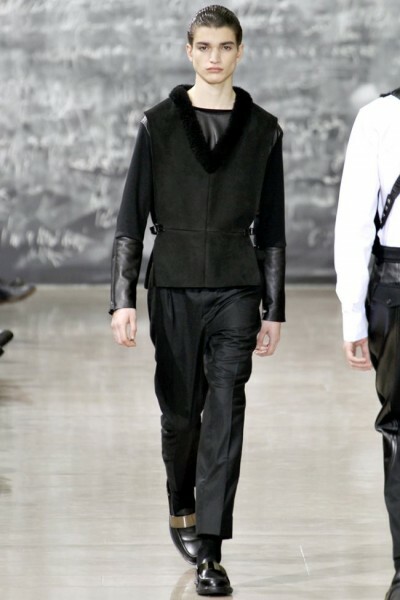 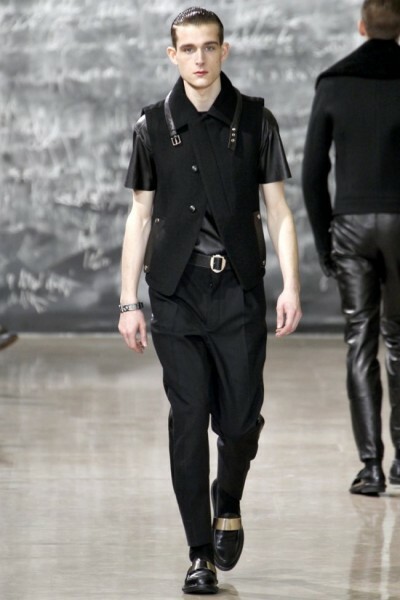 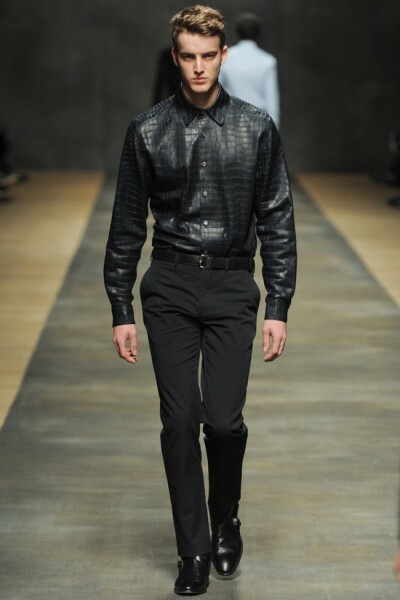 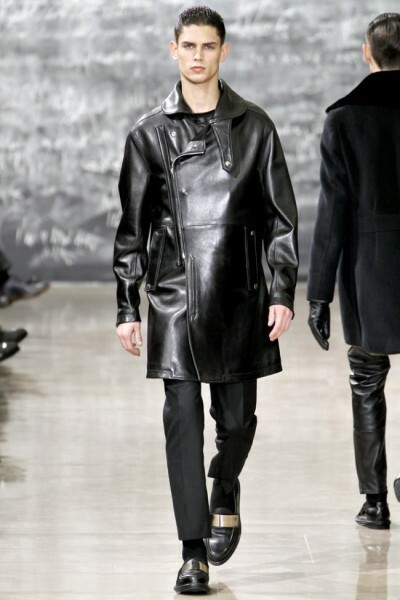 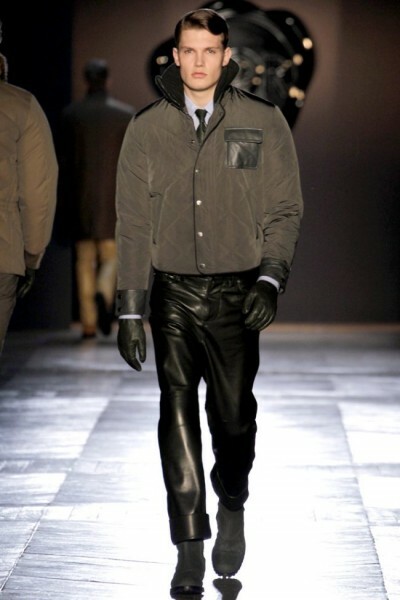 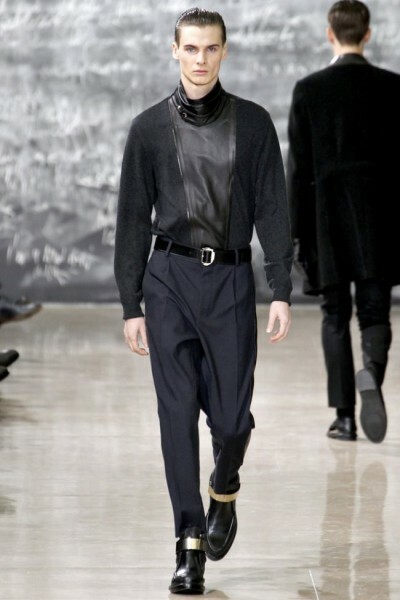 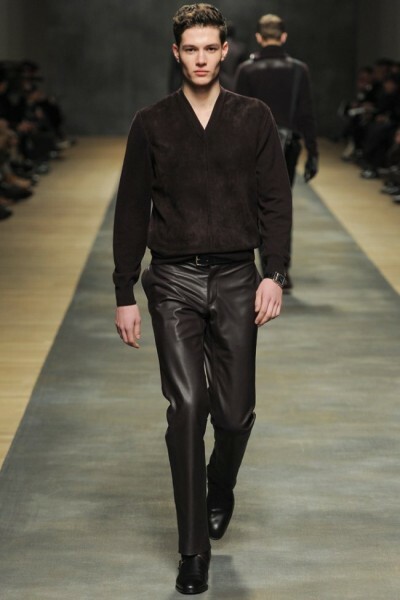 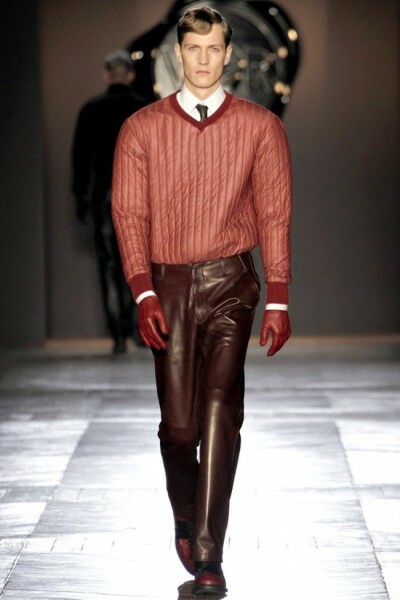 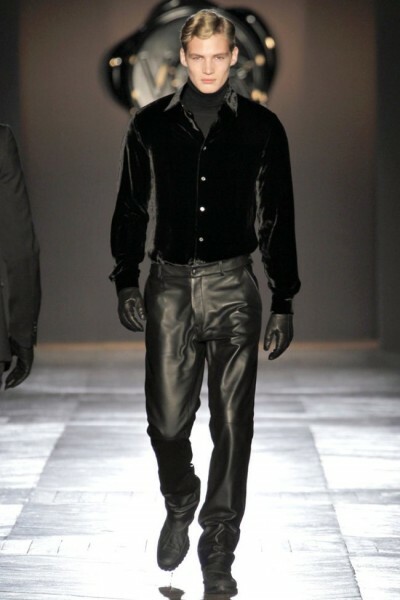 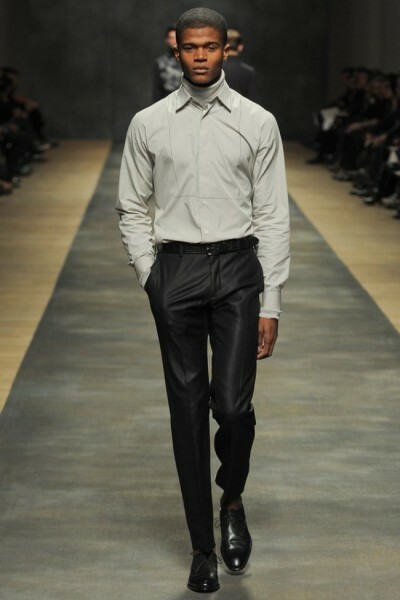 It is really interesting seeing leather pants making a hit in the collection. 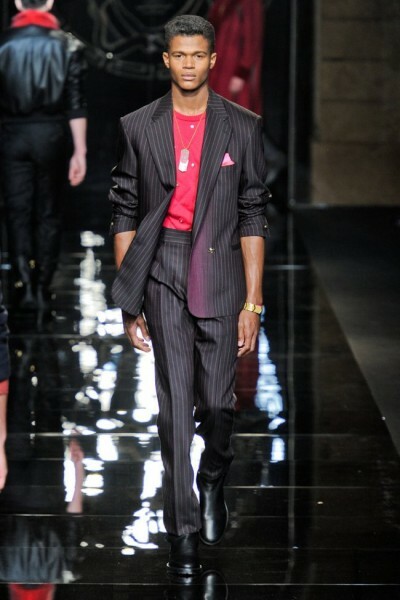 I always felt Yves Laurent was slightly conservative (yet chic), but I was proved wrong. 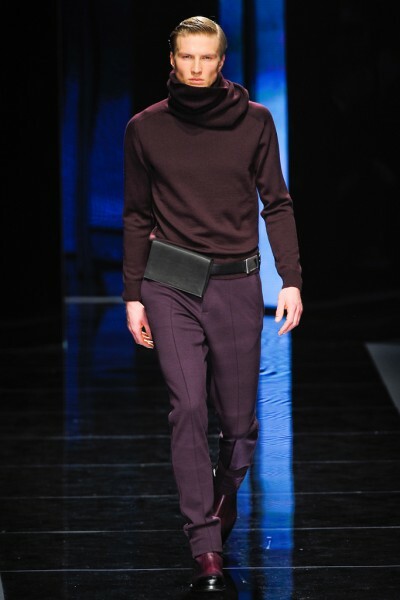 There were alot of draping in the trousers, futuristic tops which surprisingly delivers a slight edge. 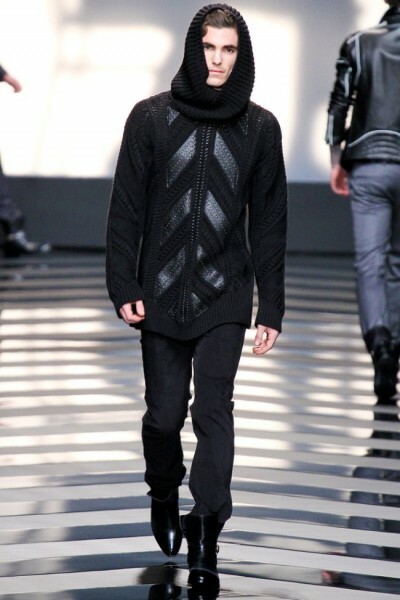 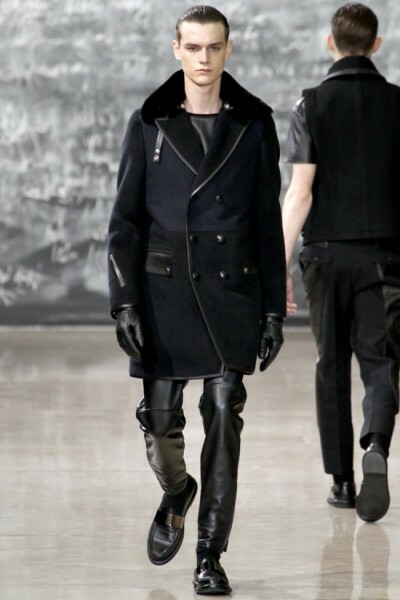 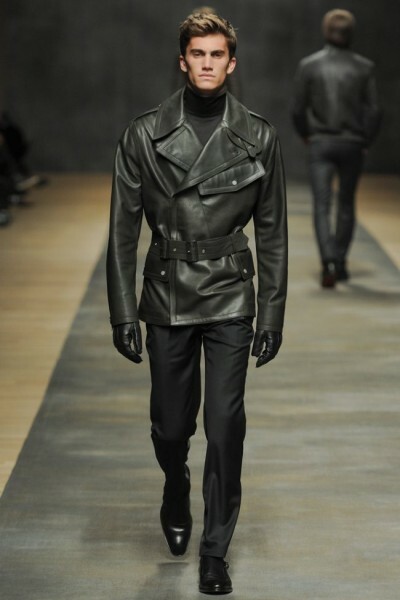 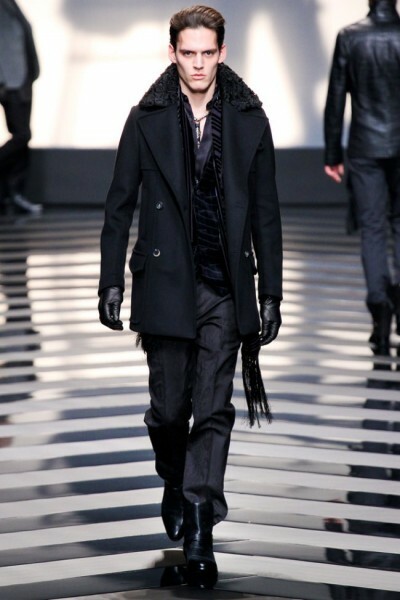 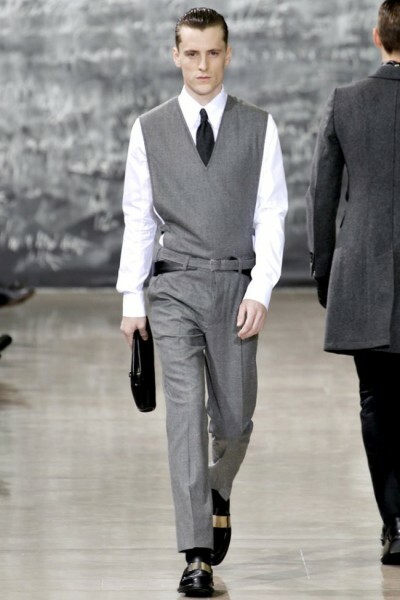 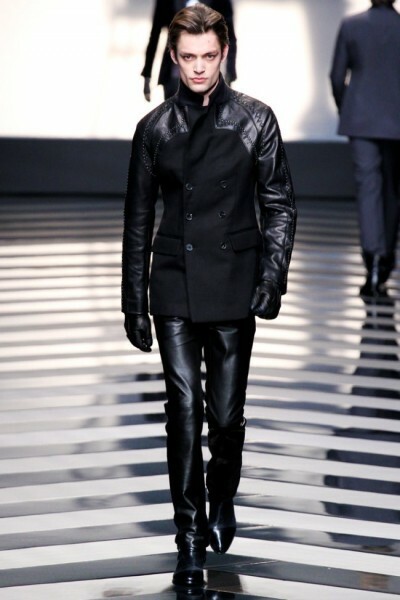 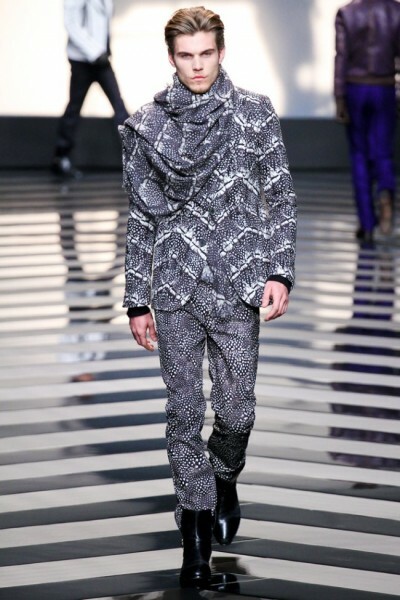 One of the first shows at Paris Fashion Week was Victor&Rolf’s A/W 2012 collection. 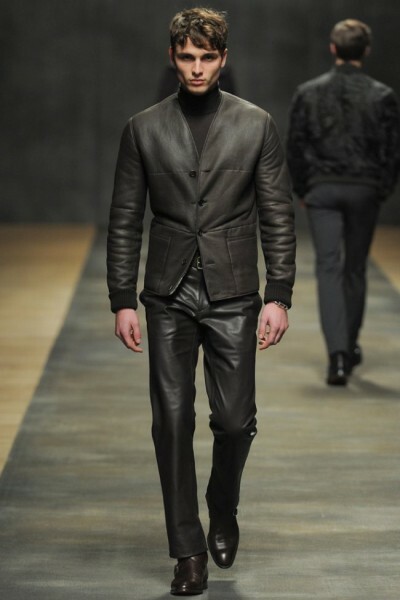 There is an array of leather pieces throughout this collection. 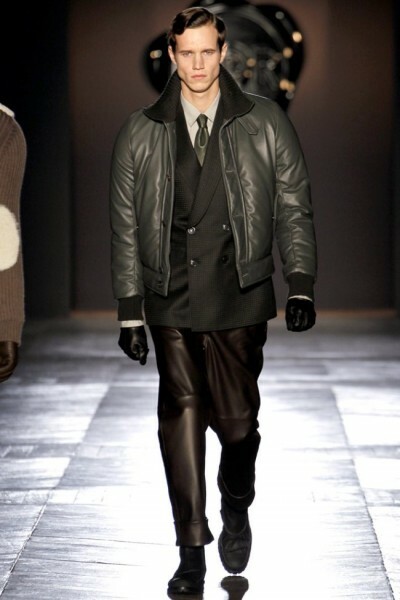 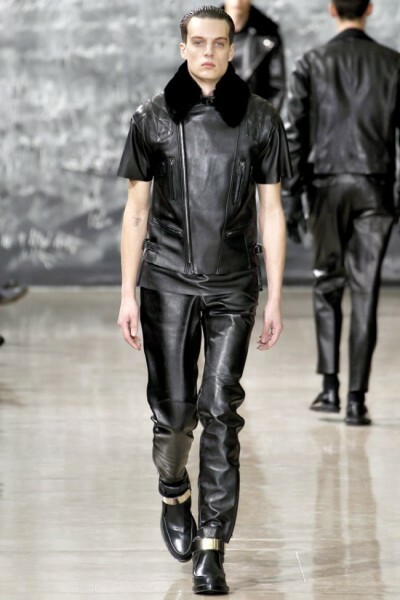 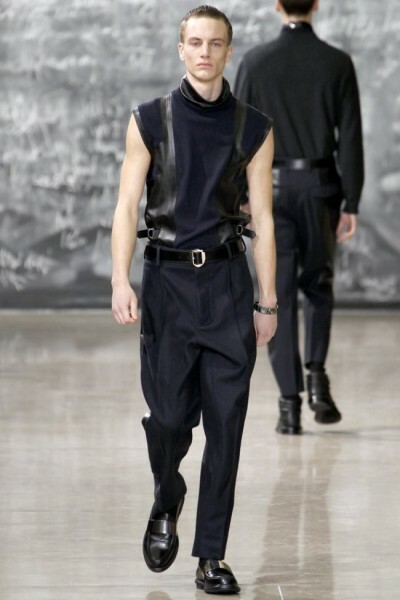 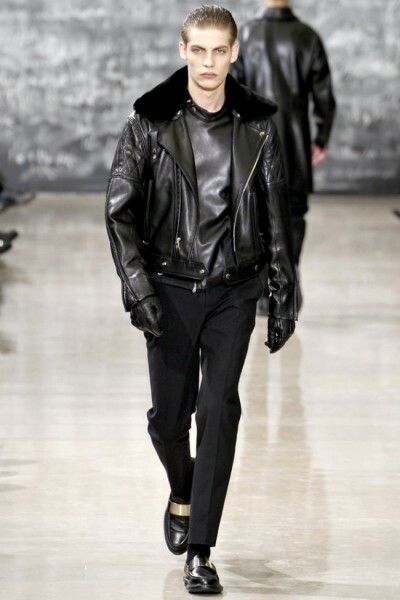 One of the most surprising ensembles was the leather overalls over the baseball jacket, shirt and tie. 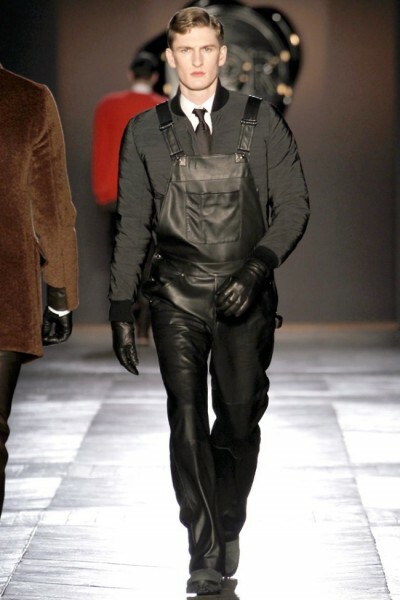 I noticed Rihanna made an attempt to make the look trendy from her return in 2009, but it quickly disappeared afterwards. 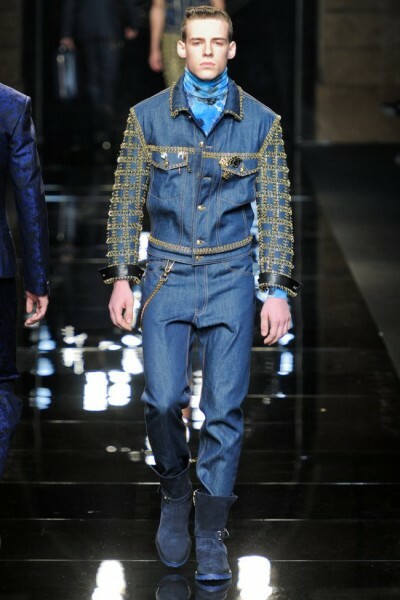 Being from Kentucky, I should have thought about something like this ensemble……Now back to the collection shall we……..One thing that stole the show were the jackets! 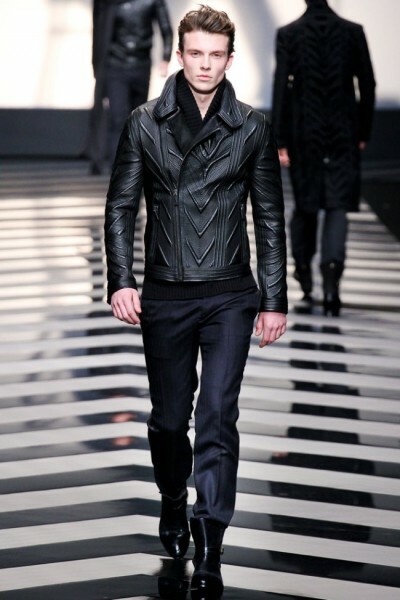 The jackets appear to give that great line without feeling a little bit bulky, which is nice. 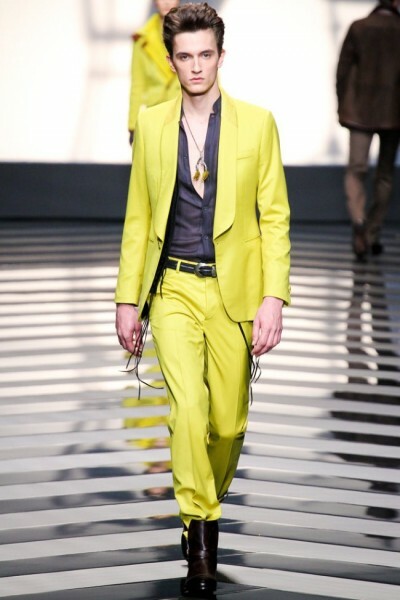 The blazers were absolutely goregous. 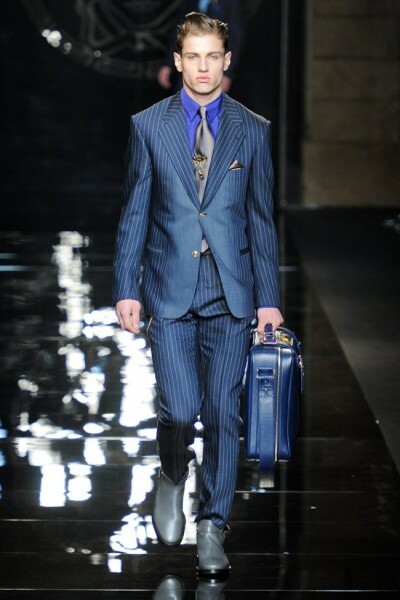 Although there was a small range of different textures, they still pack they sophisicated punch through the choices of geometric prints, varigated stripes, etc. 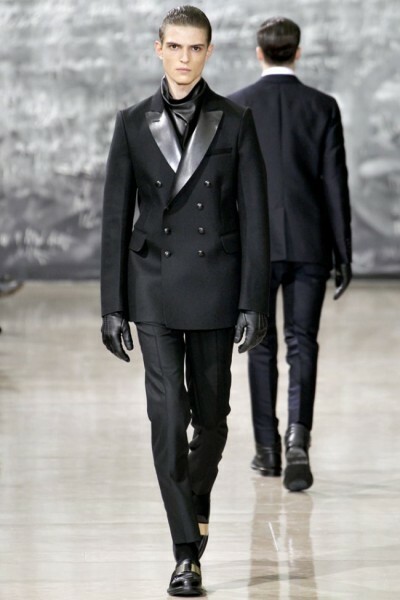 Incredibly dope! 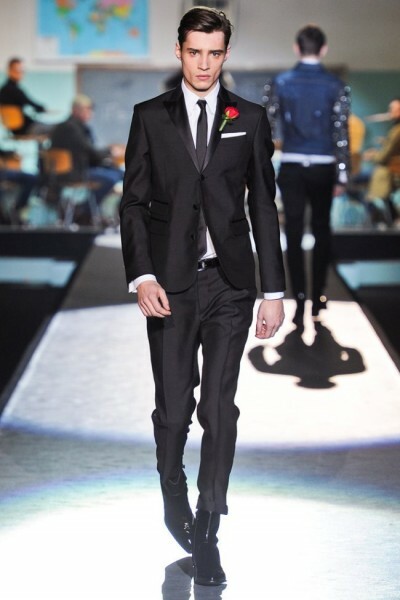 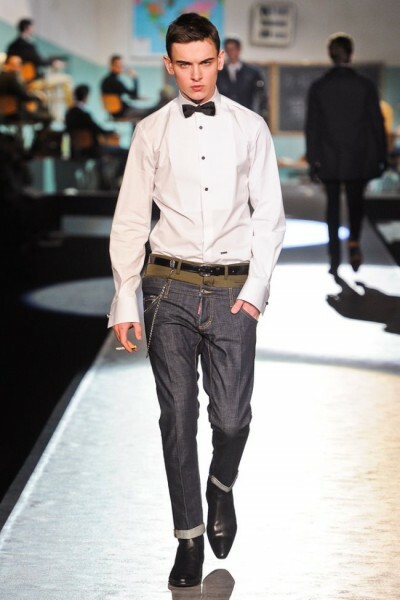 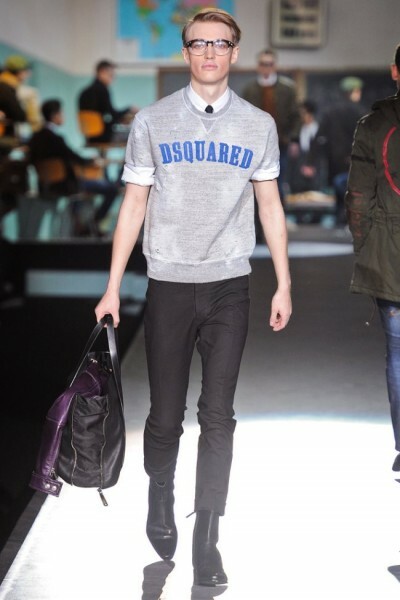 Dsquared2 collection has brought me back to memory lane from my days in school… Alright that statment is not valid, but this collection delivers school boy chic. 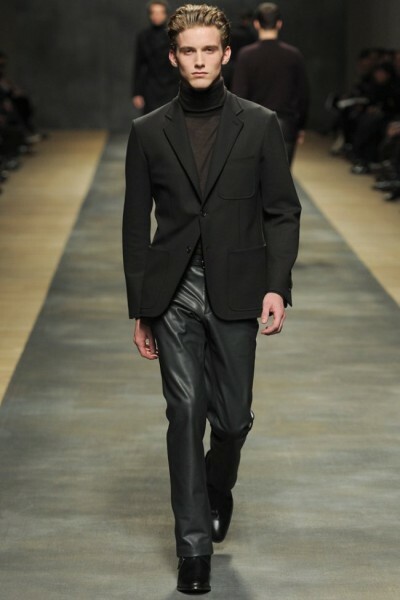 Coming straight outta some nostalgic school film where you will see Ivy League scholars rocking tweed blazers with turtlenecks to the bad boy biker looks consisting of leather jackets and distressed denim. 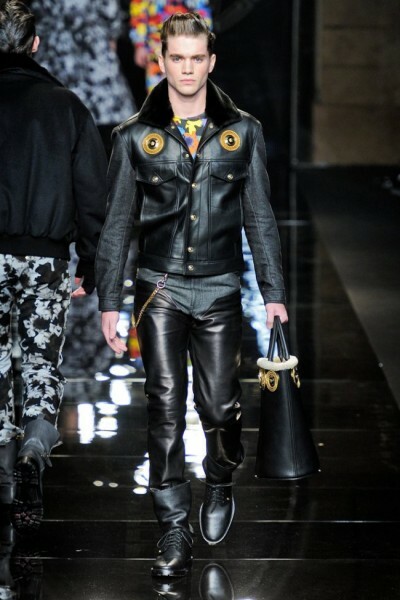 Completed with accessories such as, newsboy hats, duffels and backpacks, Stevie Wonder (no pun intended) could have seen what the inspiration was from. 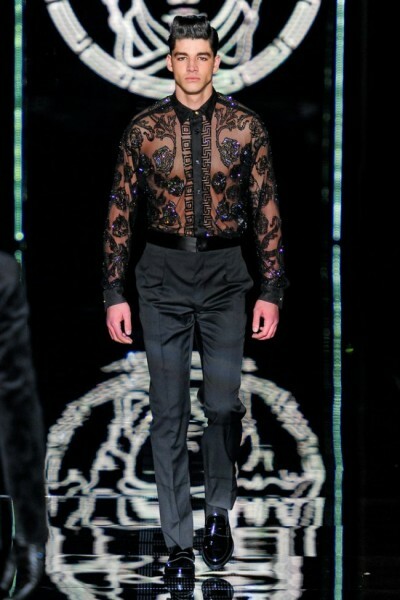 This collection truly compliments the women’s collection, hence I am sure they gave inspiration for collections. 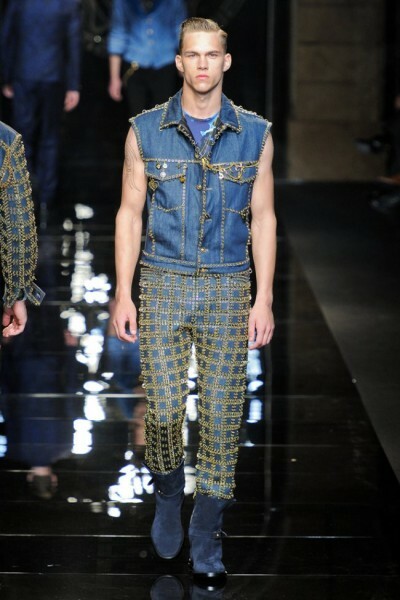 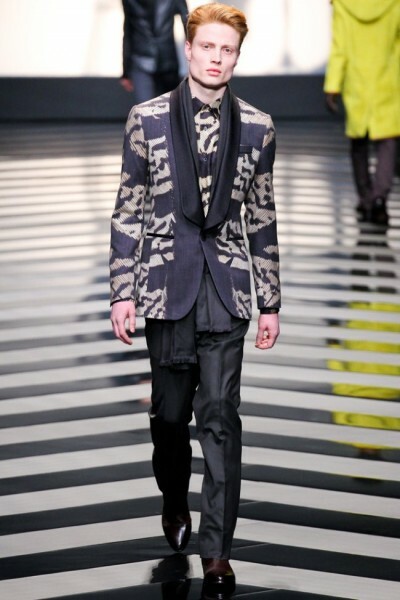 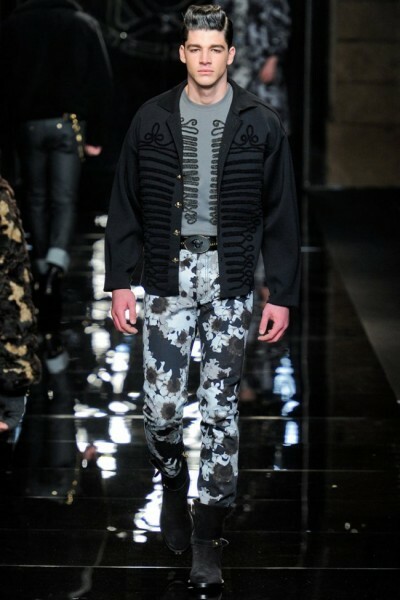 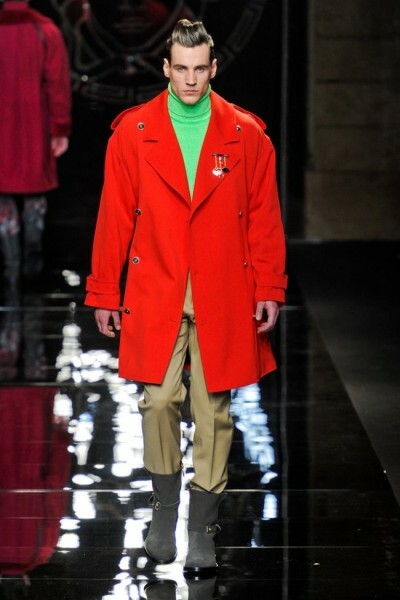 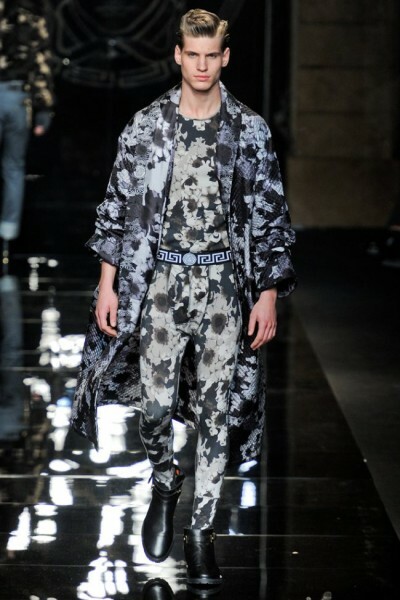 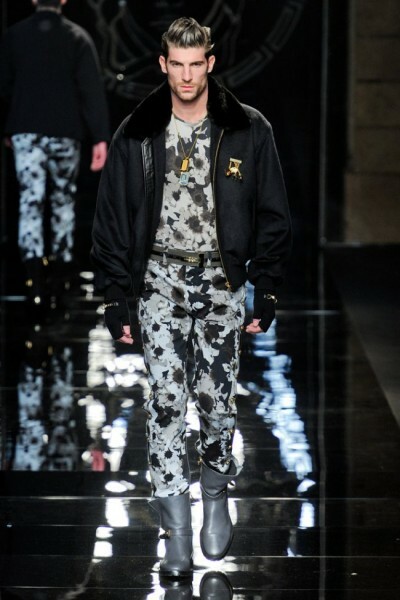 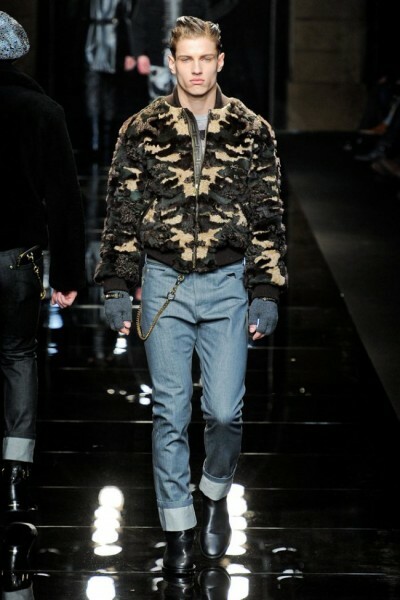 Donatella Versace has decided to take another step regards to the military trend. 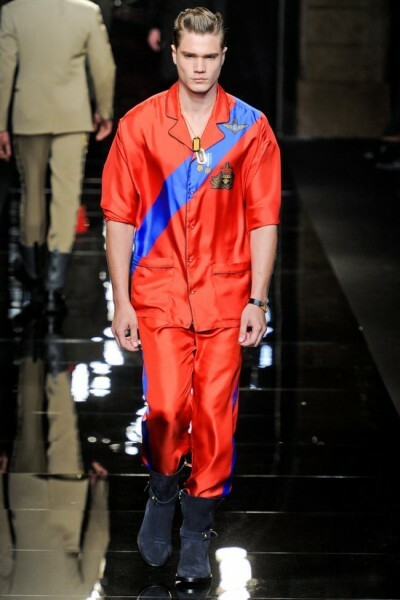 Within the past couple years, the military trend has been one of the premiere looks in fashion. 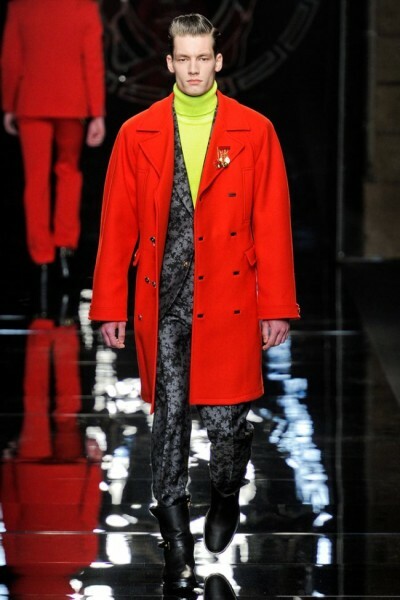 Instead of the earth tones or the monochromatic palette, she has decided to provide a more flamboyant twist. 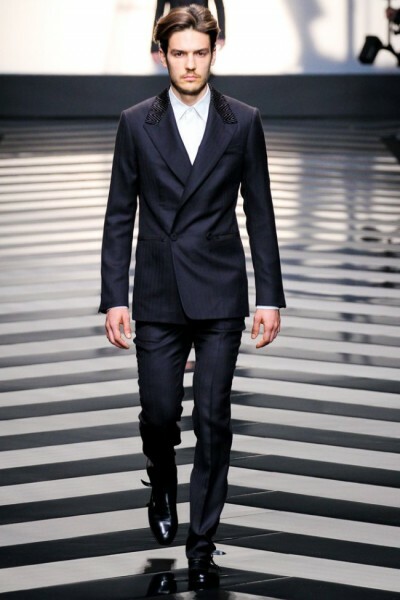 The show began with suiting. 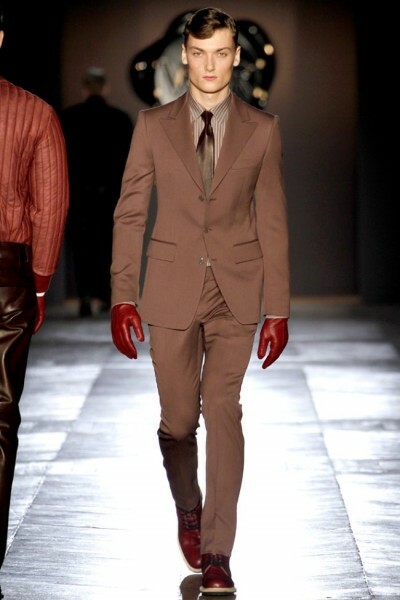 I was not sure about the entire look of the suits. 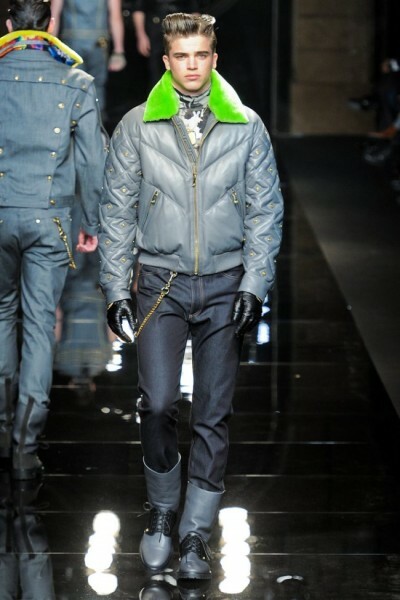 They were appear to more of a costume instead of appealing. 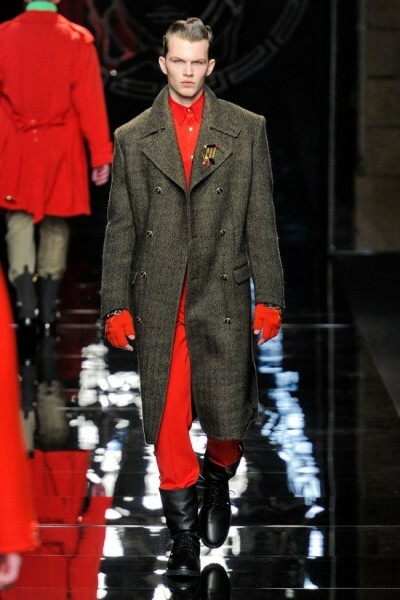 dressed in camouflage, the range transitioned to studded blue denim before moving on to audacious ensembles in red. 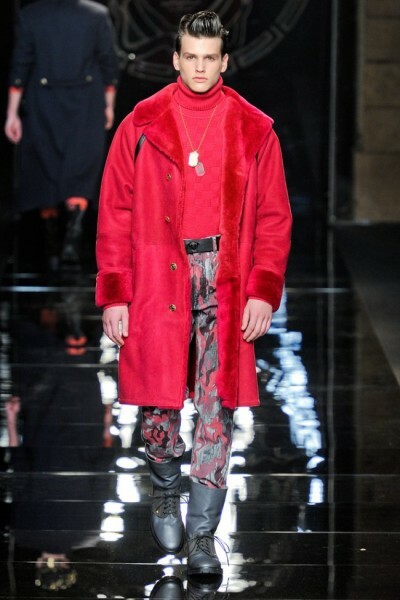 Vibrant red fur coats were the highlight of the collection. 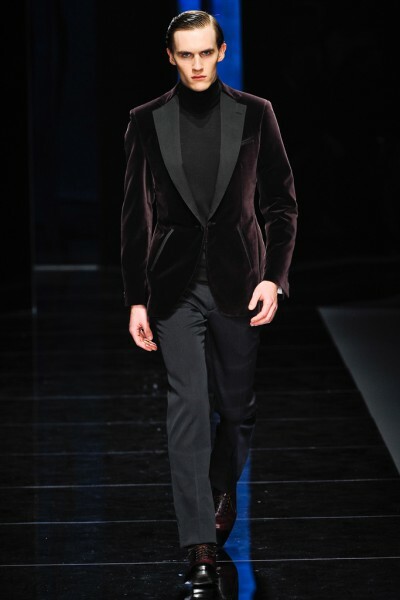 Whenever I think about Salvatore Ferragamo, I instantly think about sophisicated italian sartorial looks and hollywood glamour. 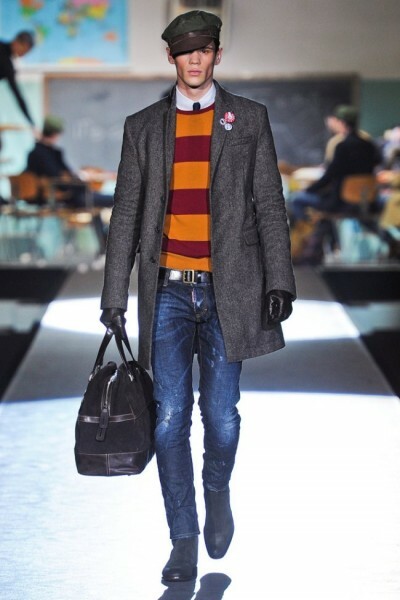 This fall/winter 2012 collection truly gives that vibe! 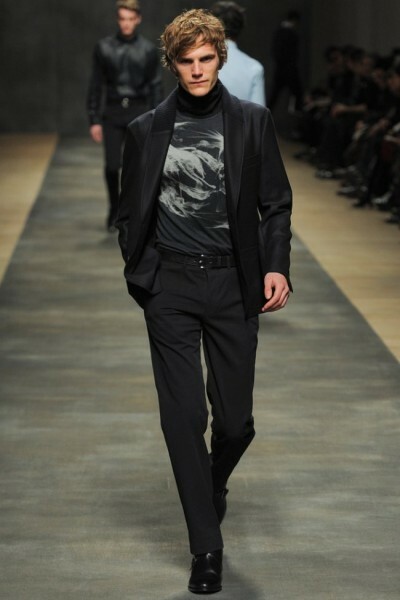 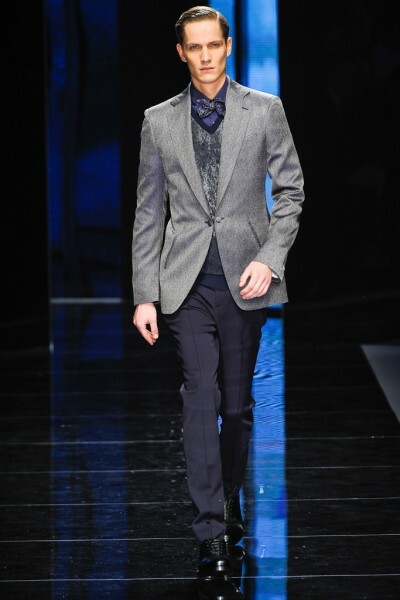 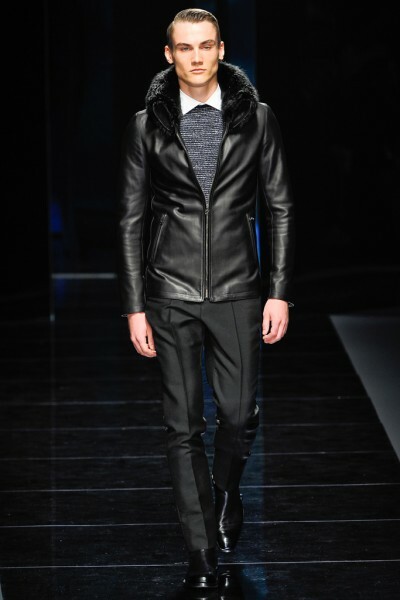 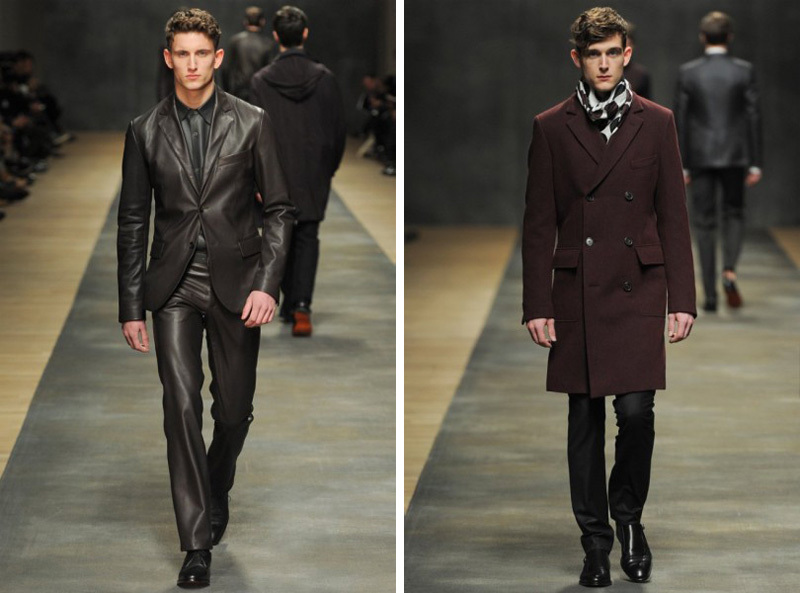 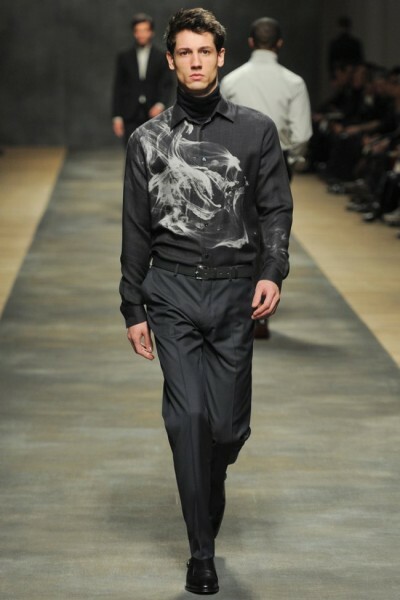 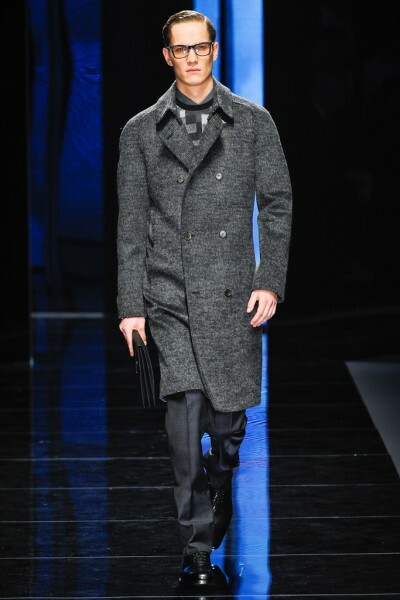 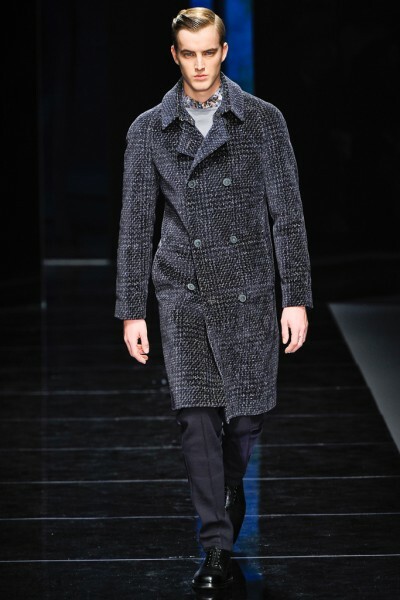 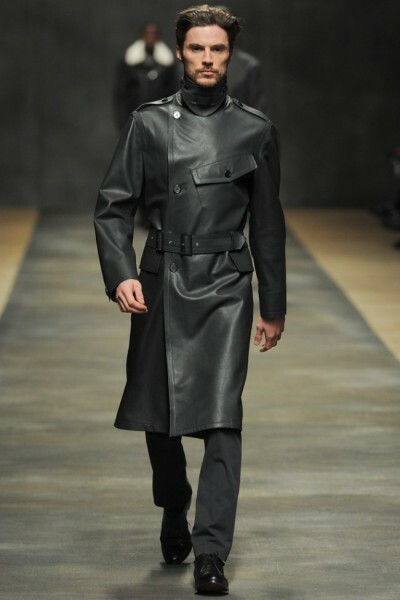 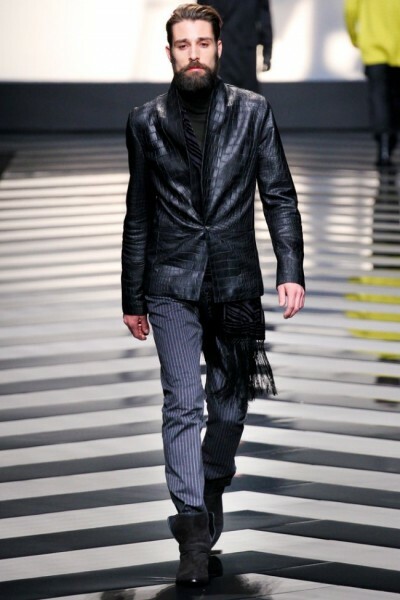 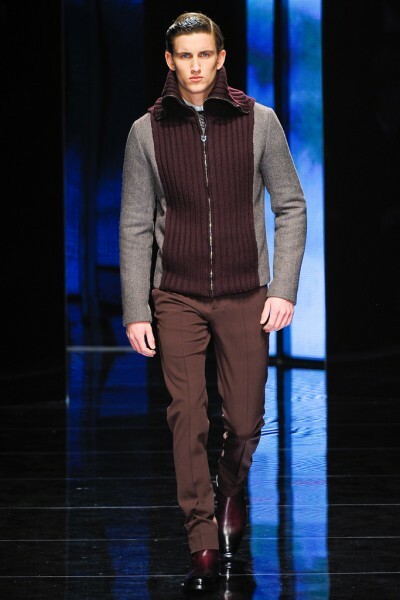 Creative director Massimiliano Giornetti made a rich collection inspired by the urban landscape. 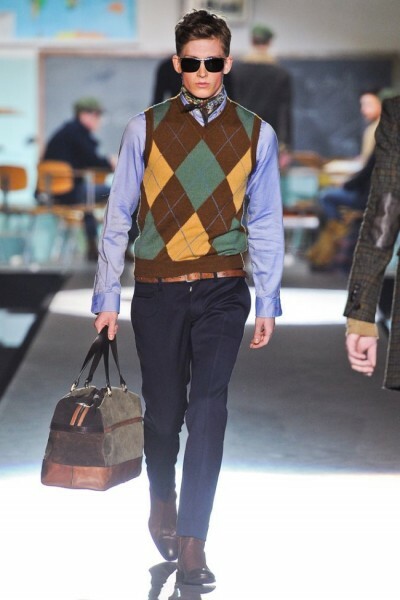 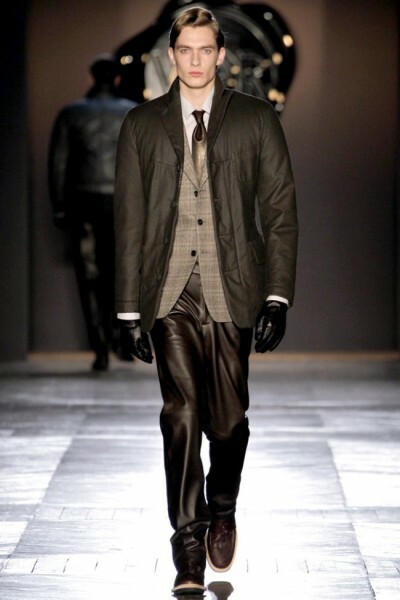 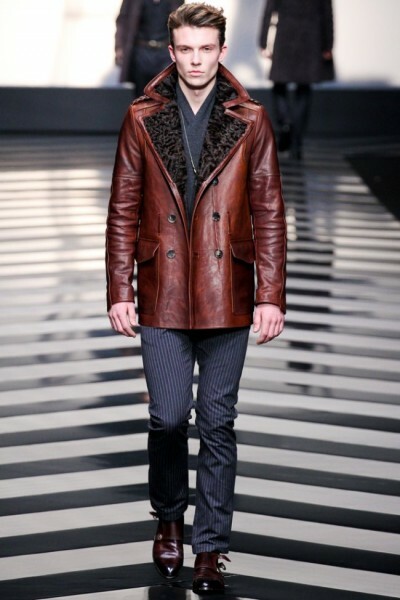 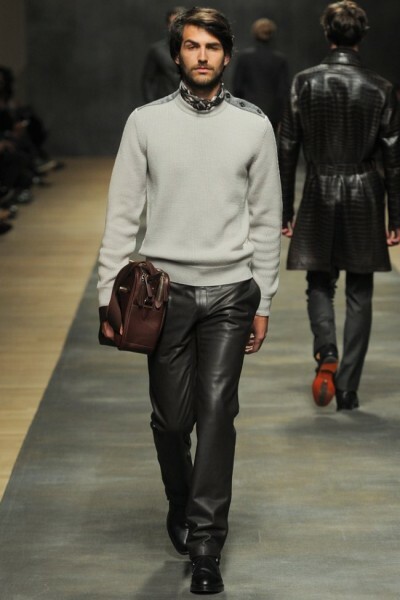 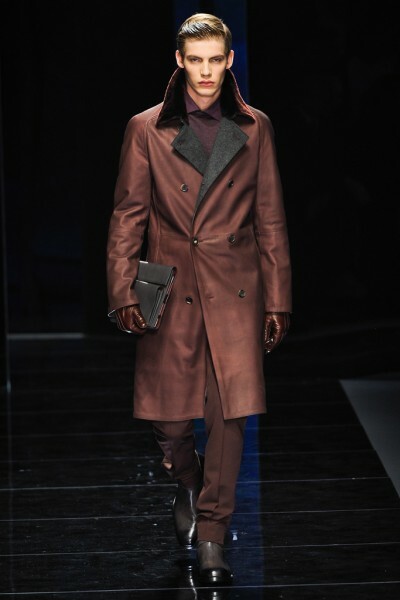 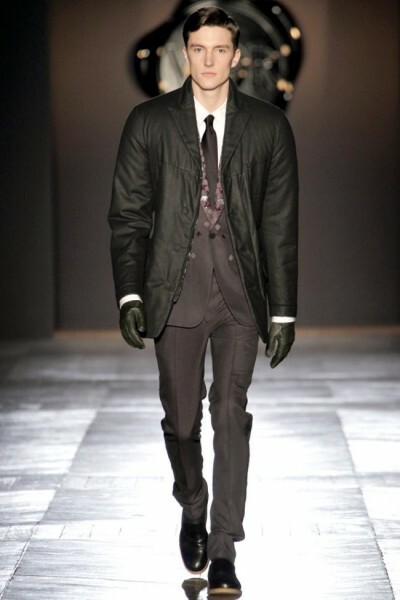 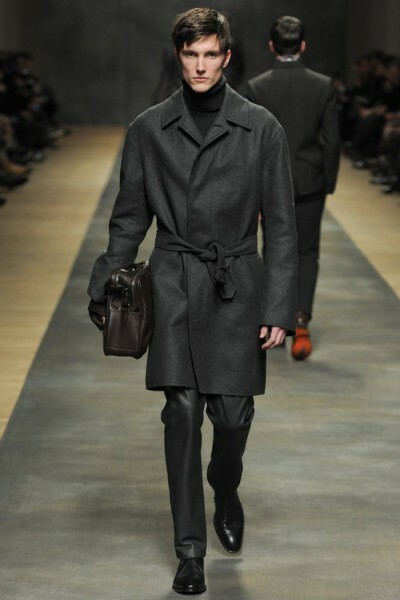 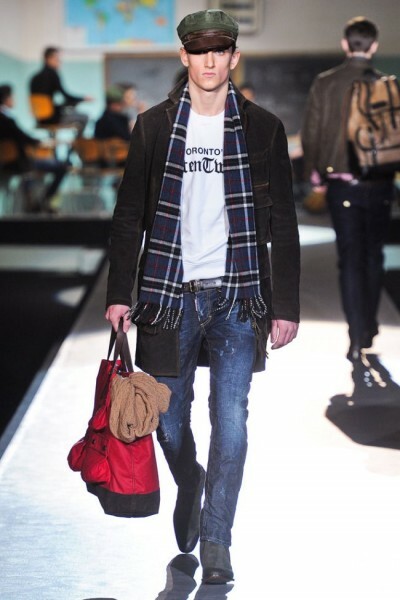 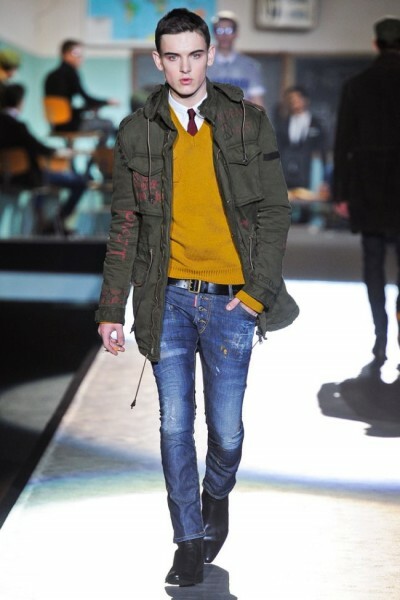 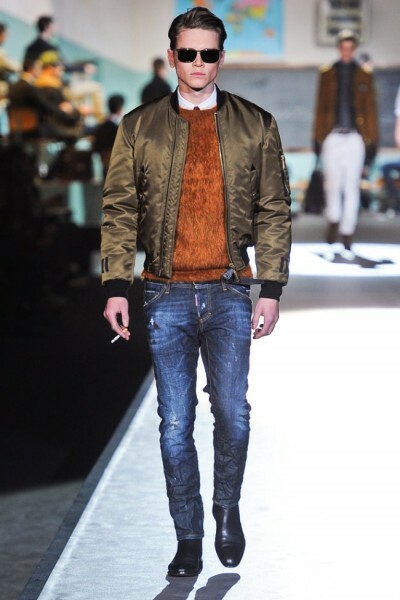 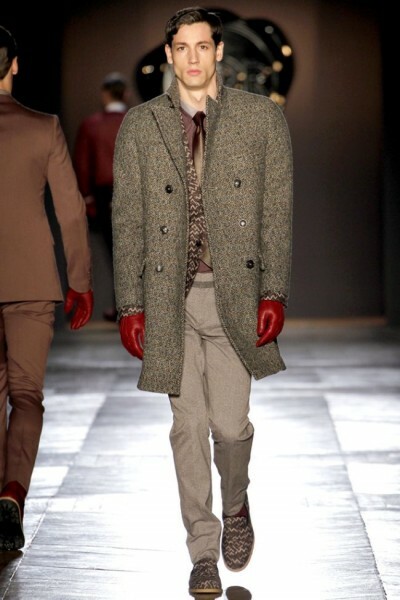 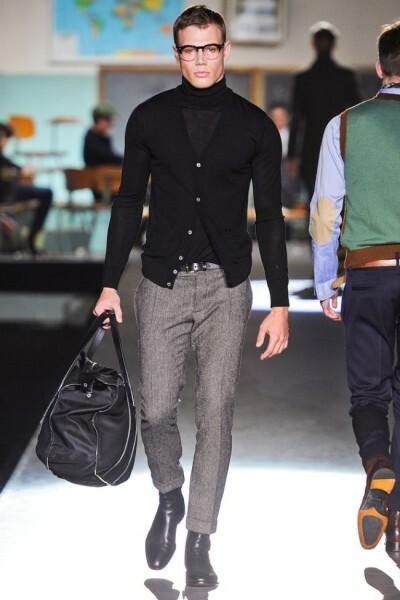 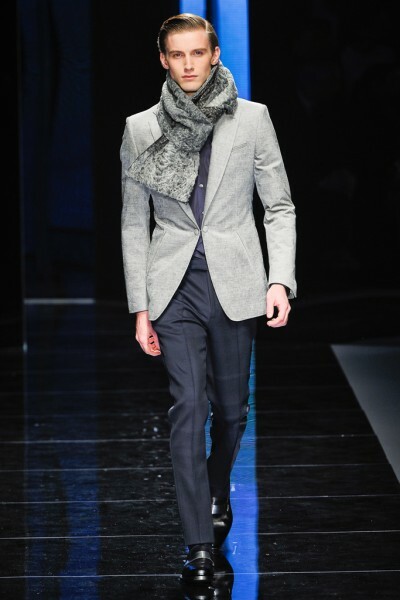 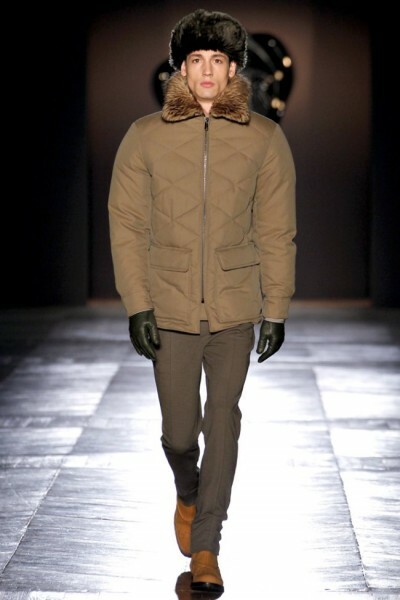 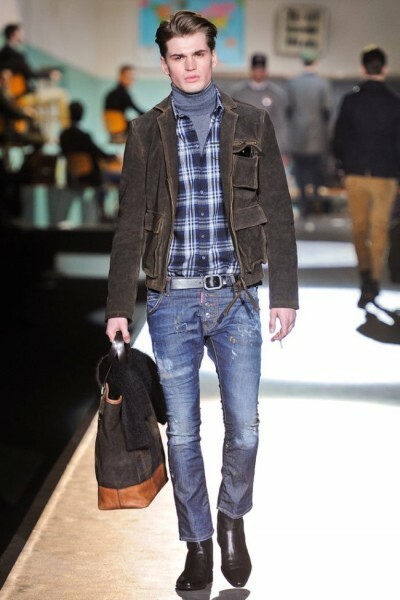 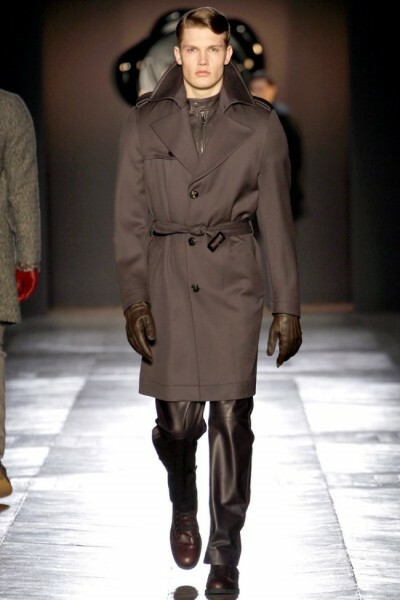 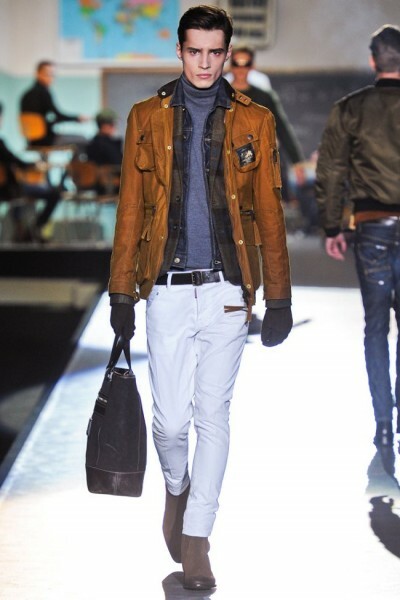 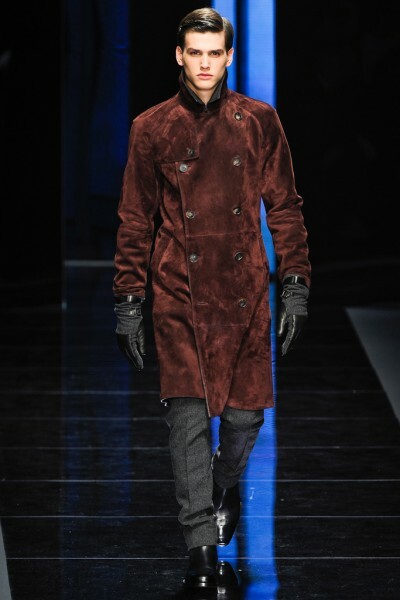 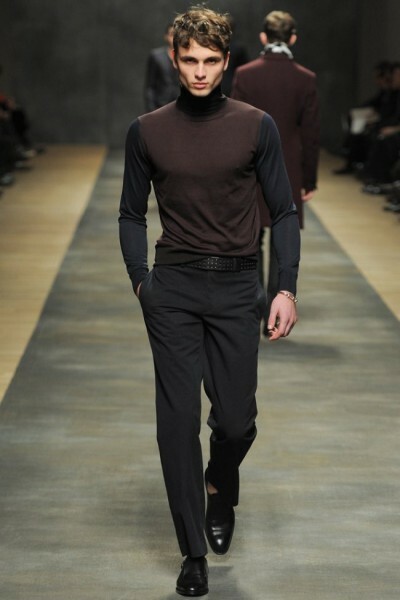 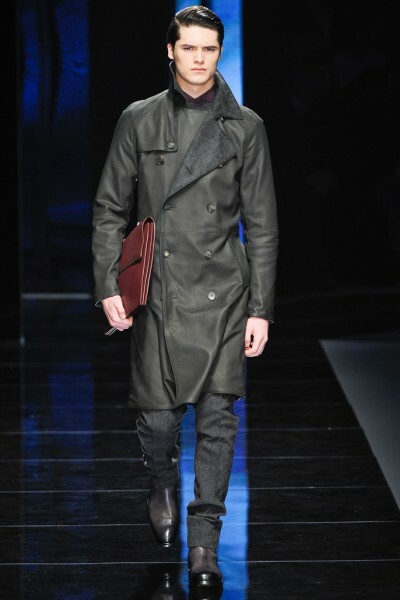 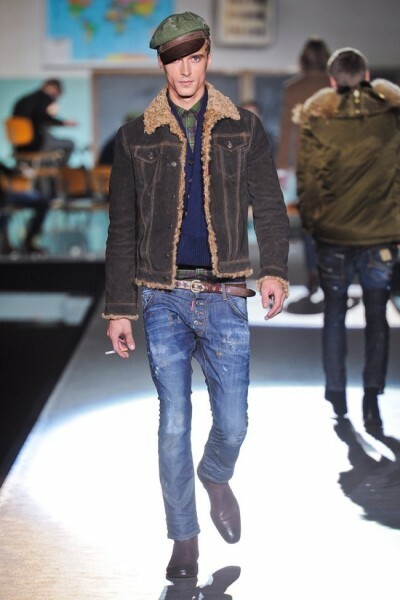 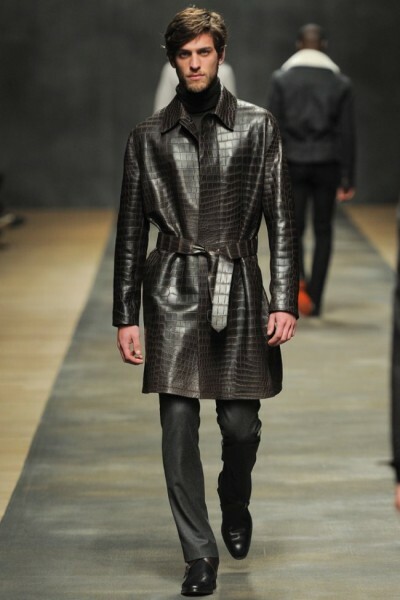 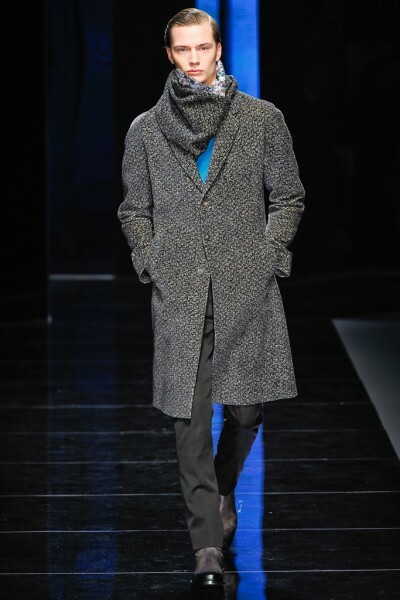 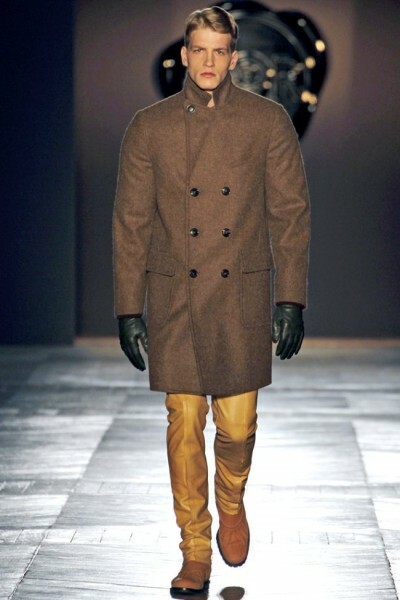 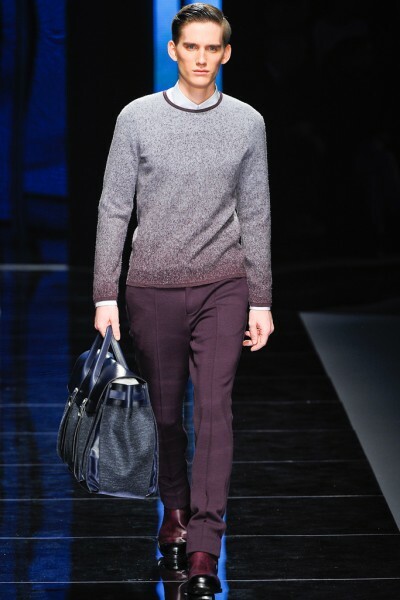 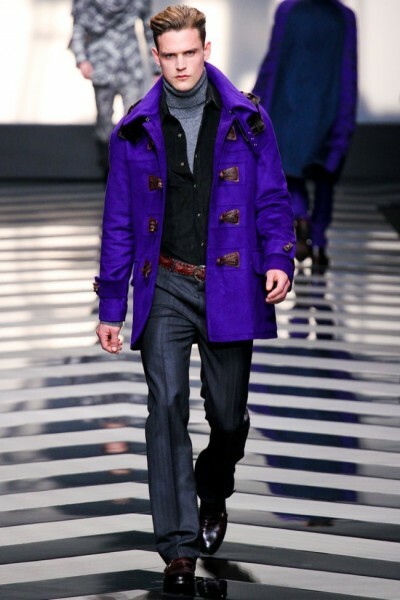 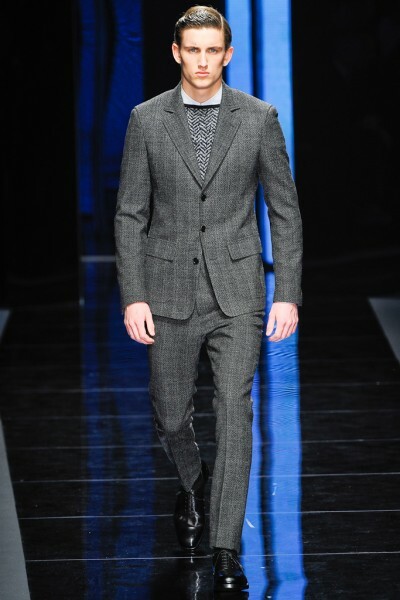 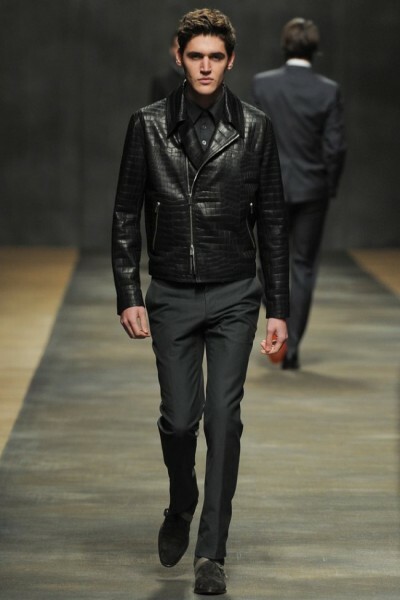 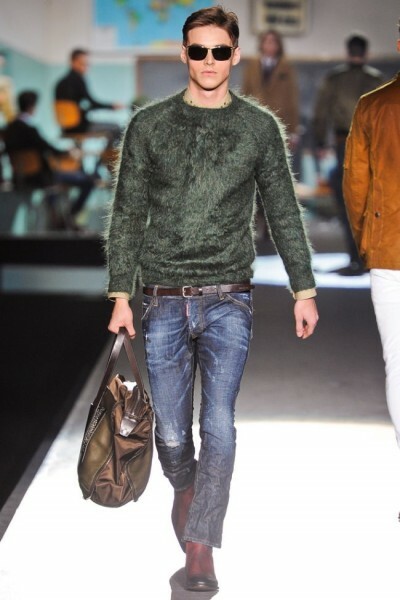 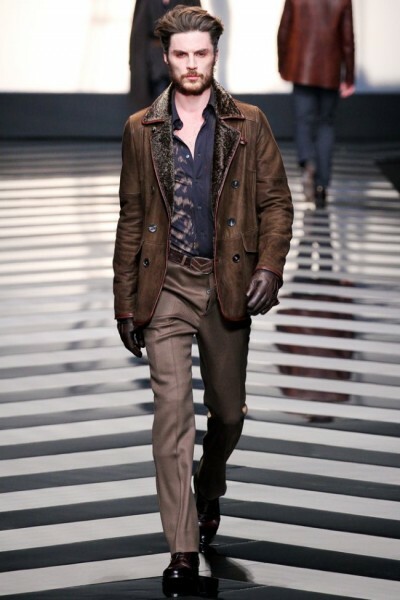 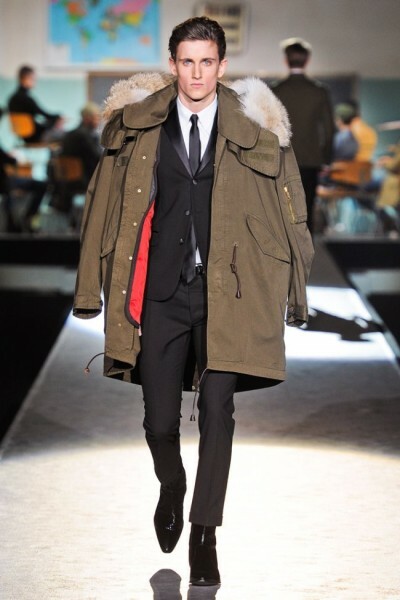 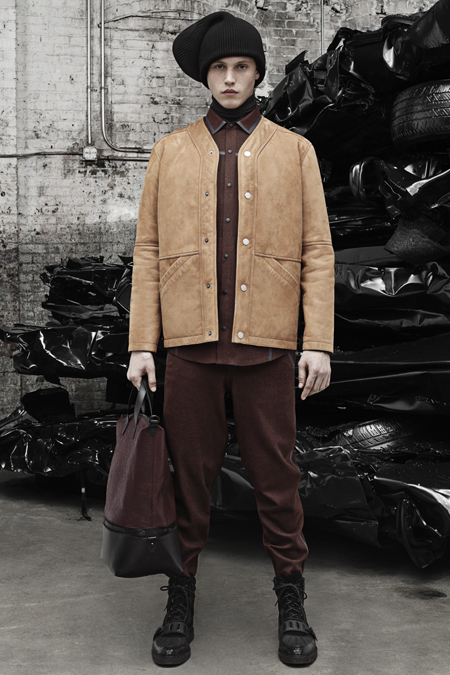 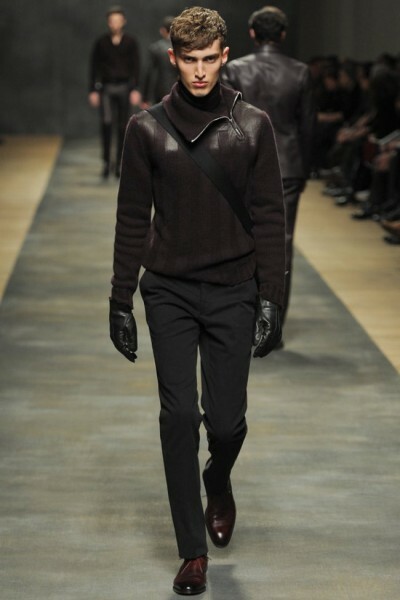 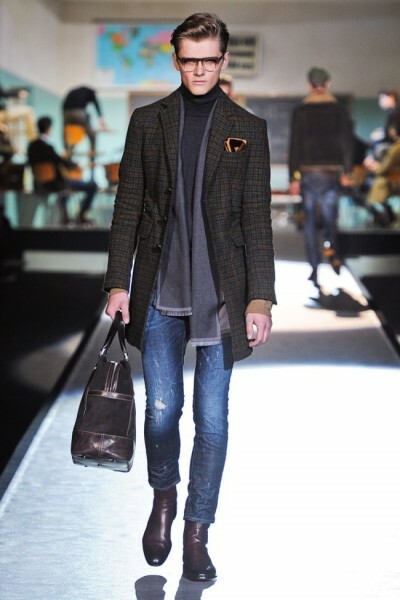 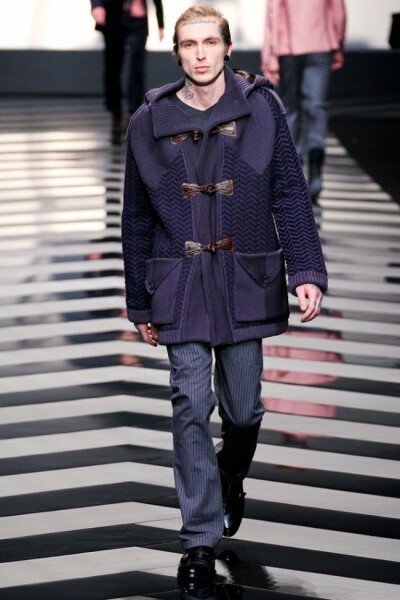 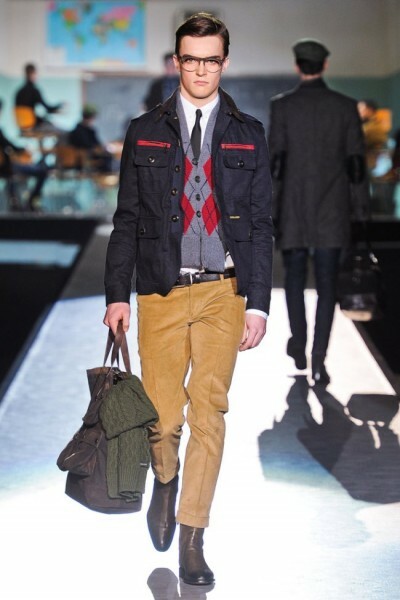 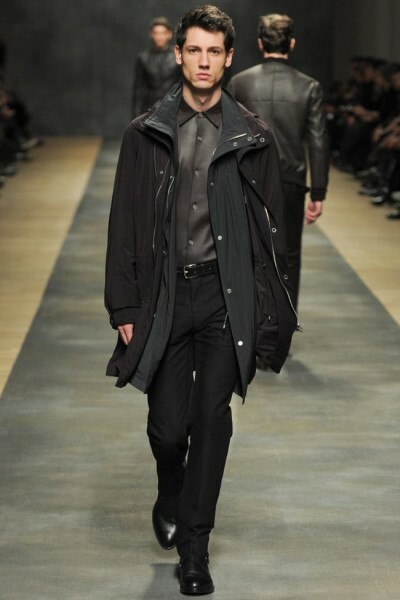 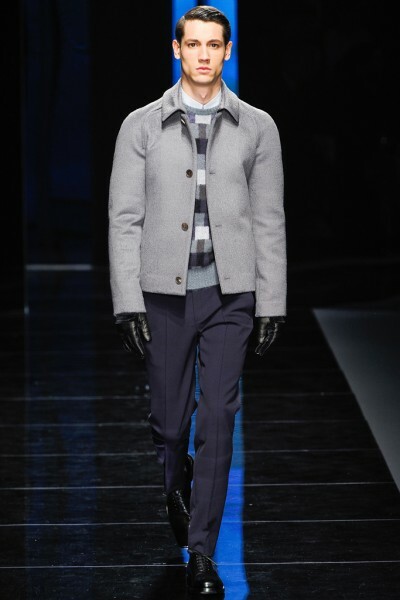 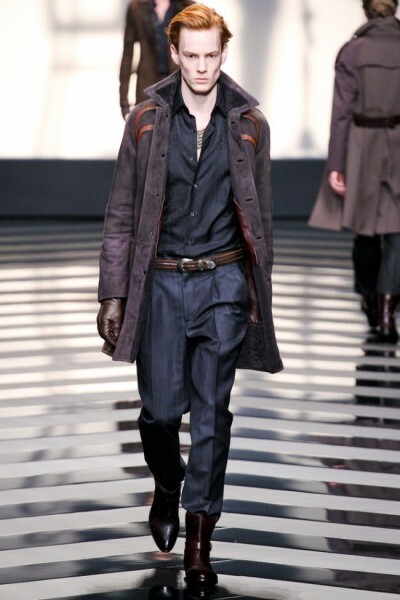 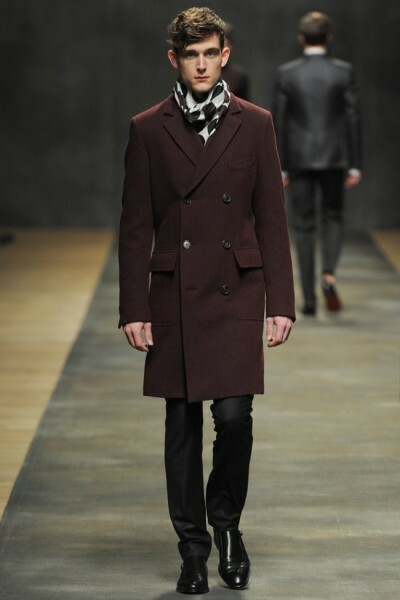 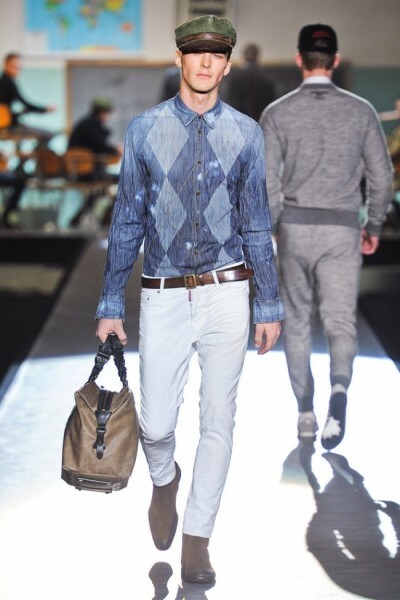 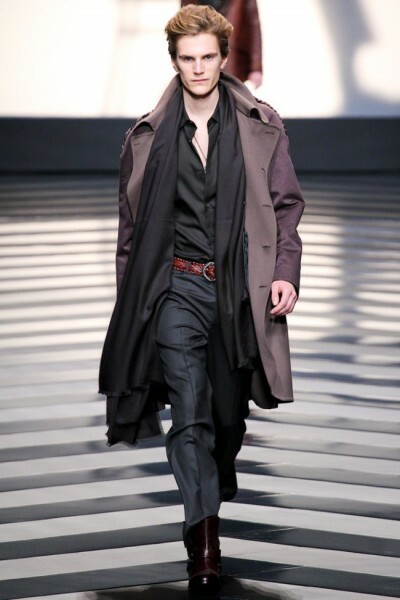 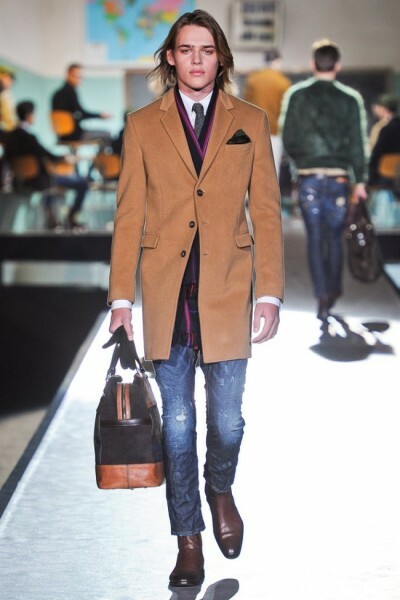 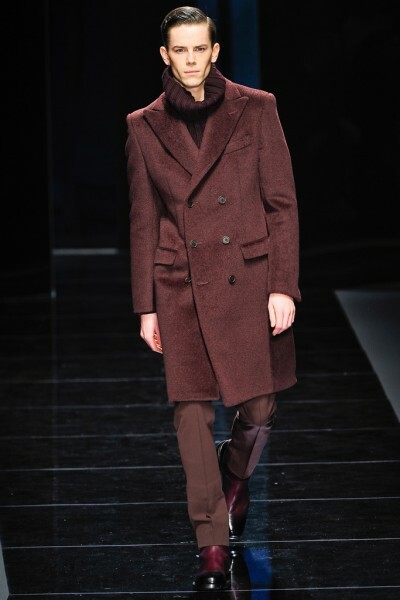 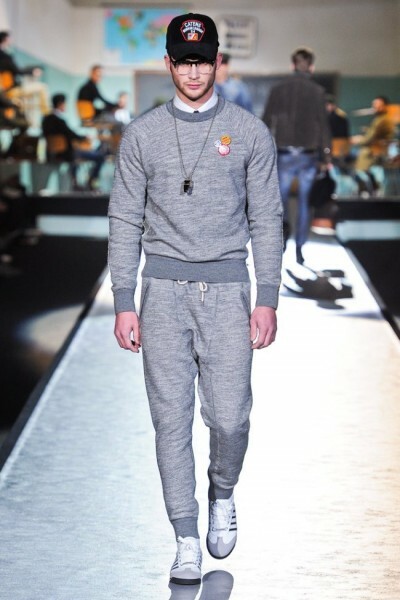 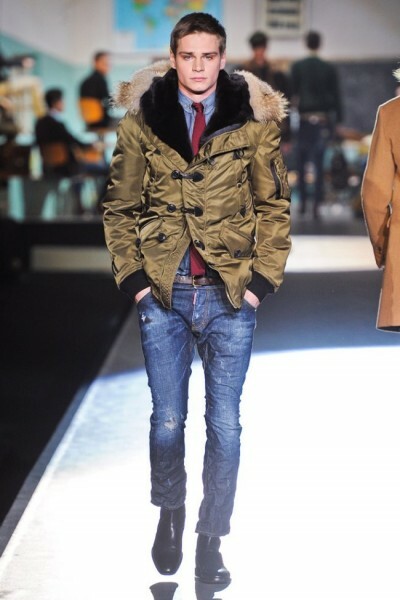 Giornetti created a strong color palette, clean masculine silhouettes, outerwear and accessories. 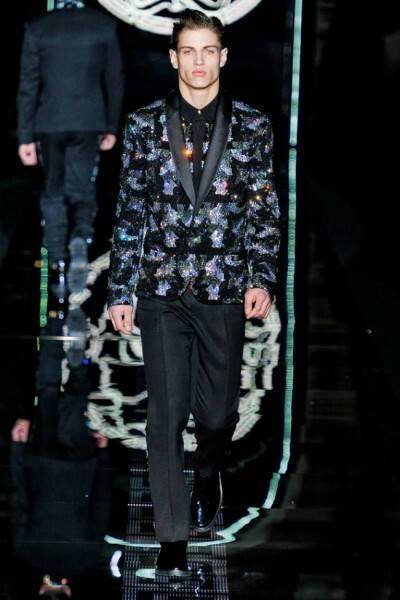 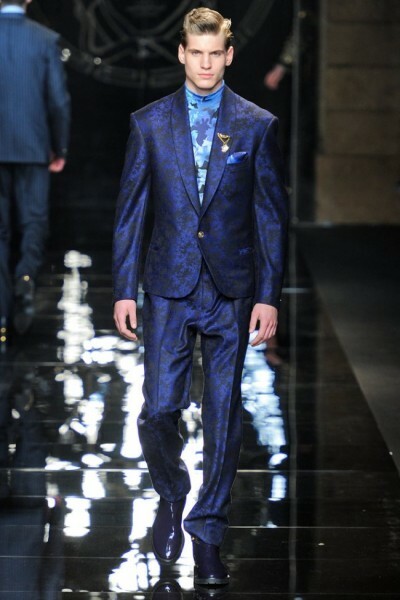 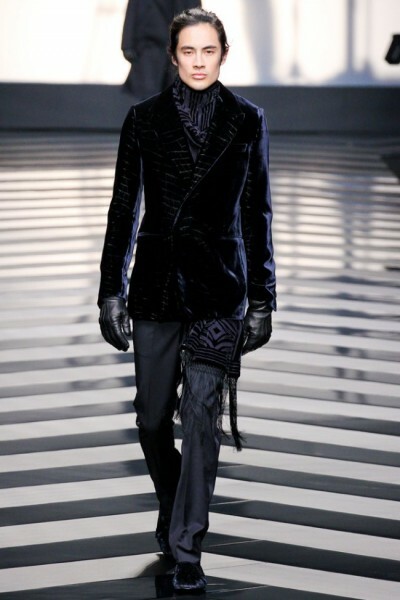 There are some intricate prints with beautiful velvet jackets and Double breasted suits. 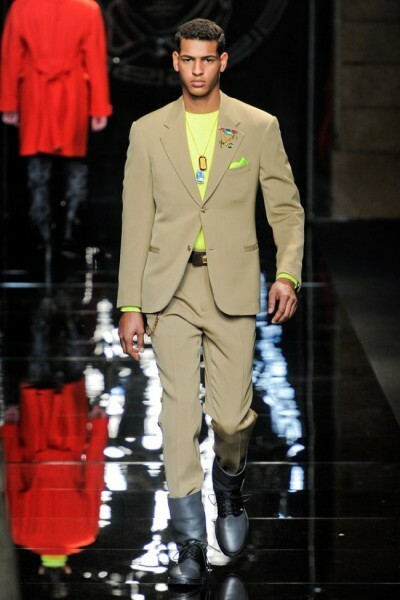 If Douglas Fairbanks or Cary Grant was still alive, this collection would be something they would rock! 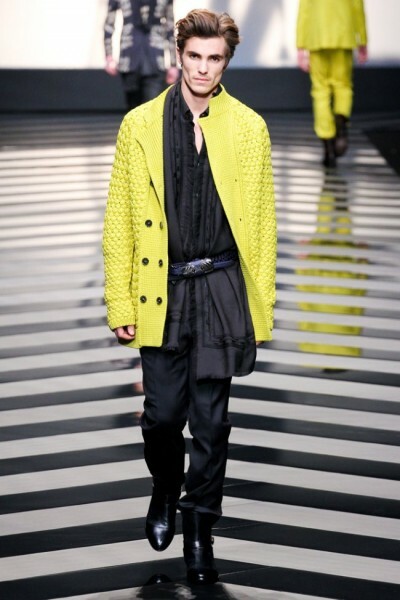 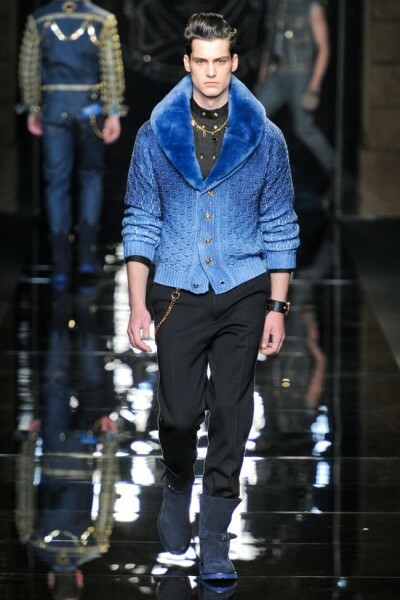 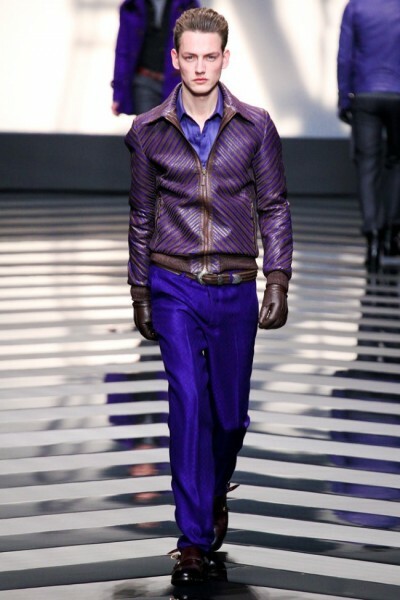 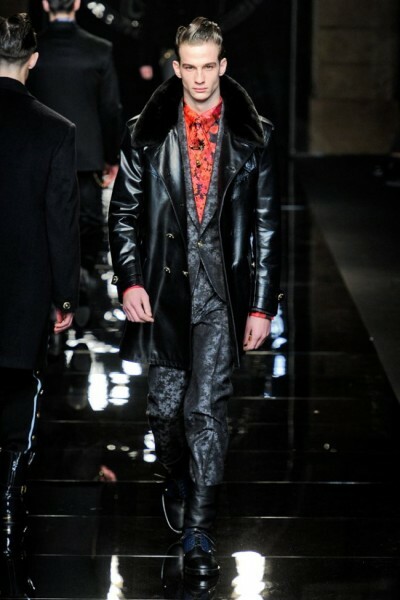 Roberto Cavalli‘s collection is loaded with different silhouettes and a dope color palette for the fall 2012 colelction. 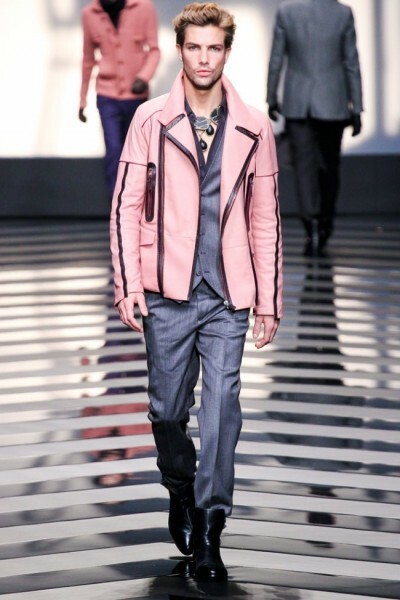 The beauty of his outerwear pieces are taking the main role it seems.. From tailored and fitted to oversize and playful, Roberto Cavalli’s latest collection fuses elegant pieces and modern looks together to create another masterpiece.